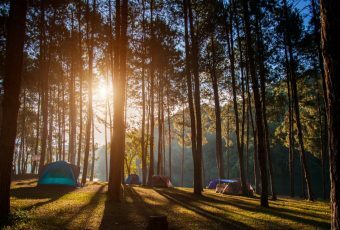 Imagine you’re in the woods. As you walk and enjoy the scenery, you chance upon an airplane. What would be your first thought? 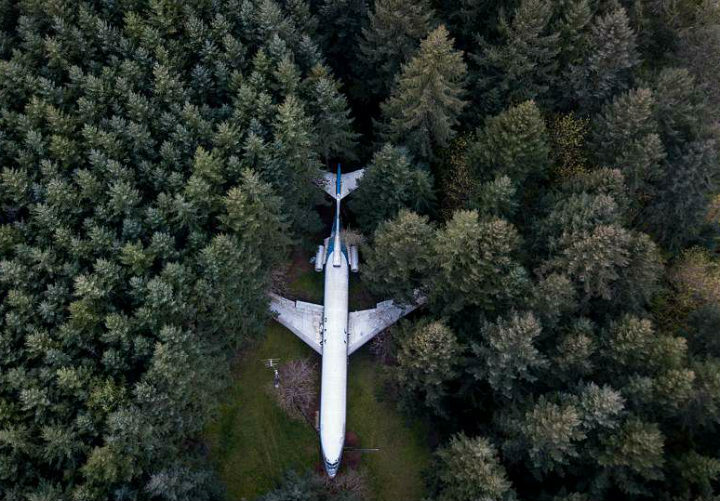 Maybe you’d wonder if there had been an unidentified plane crash in the area. 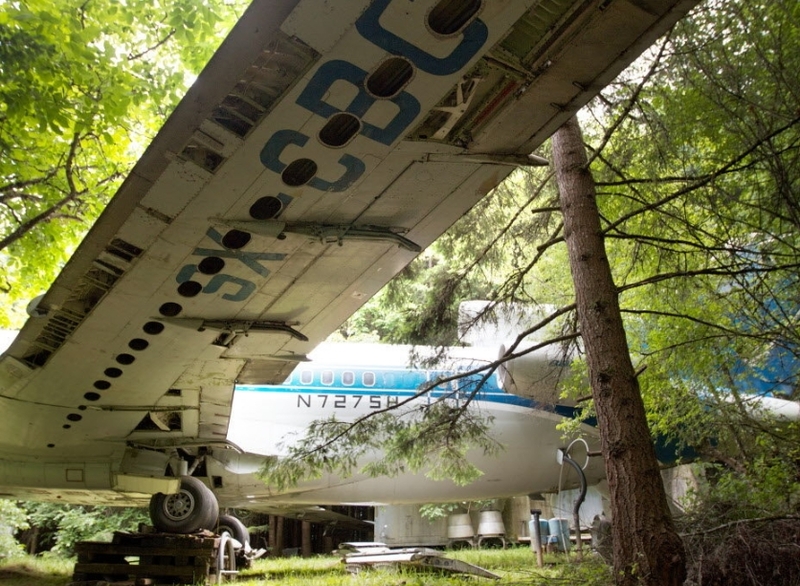 You might even think you’ve come across an old junkyard for planes. If you are in Hillsboro, Oregon, however, then you just stumbled upon Bruce Campbell’s not-so-humble home. Now we are sure that Campbell is not the first person to ever create a home from something that was intended to be used for something else entirely. There are many other people who have made some pretty crazy homes for themselves. Let’s suppose that cars and boats becoming homes are not that strange – we see them all the time. But what about other things? 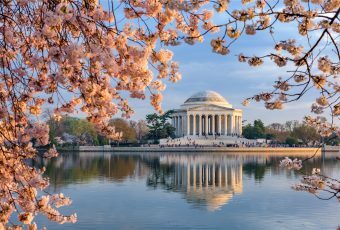 There are many cultures that have created their living spaces in and within trees. 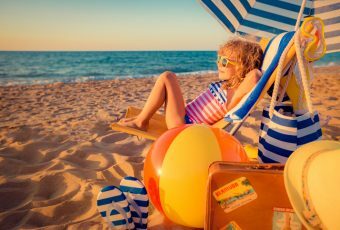 There are others that have used straw, mud, bricks and stone, but who would have ever thought to use an actual airplane? Well, we now know the answer to that question. 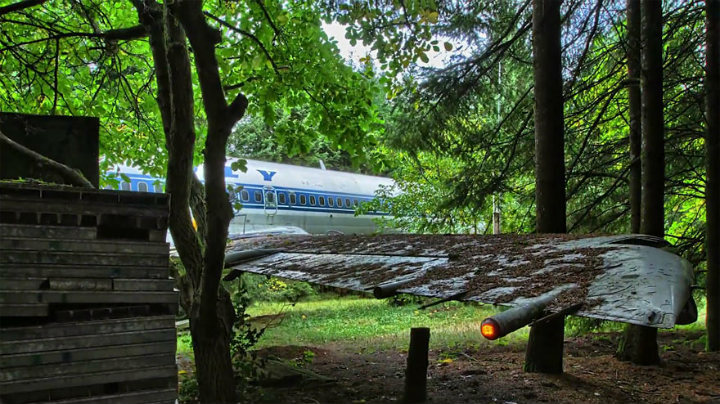 Taking an airplane and converting it into a home was by no means going to be an easy task for Bruce Campbell. There were so many different obstacles in his way. 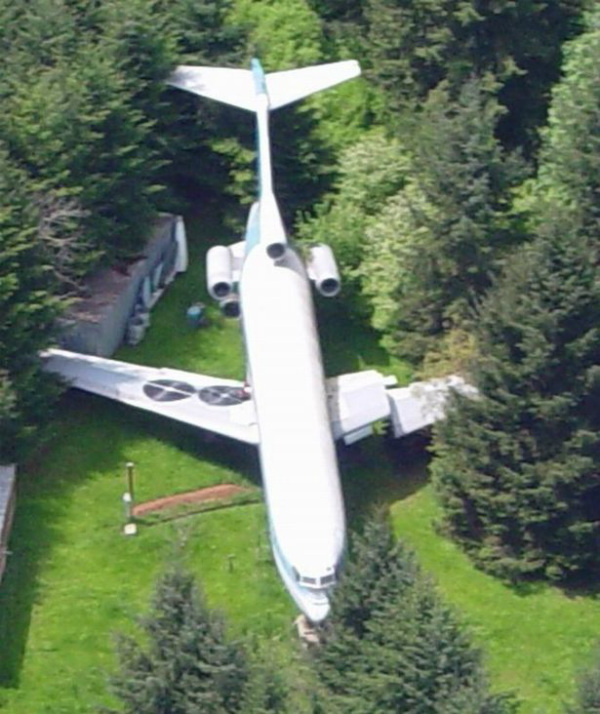 Even if we don’t get into the laws surrounding such a job, can you even begin to think what it would be like to lug the massive aircraft into his backyard? 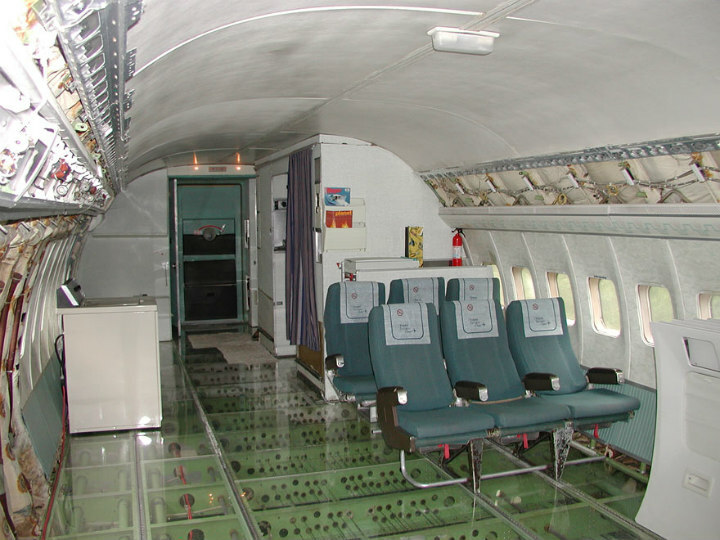 And possibly even more challenging, who said that it would be easy or worth it to transform the Boeing 727 into a home that could accommodate his needs. It’s not like the plane is shaped in such a way that would grant him space to make a spacious living room, kitchen or bedroom. However we need to remember that we’re talking about a really talented man! Bruce used to be an electrical engineer but he is now retired. 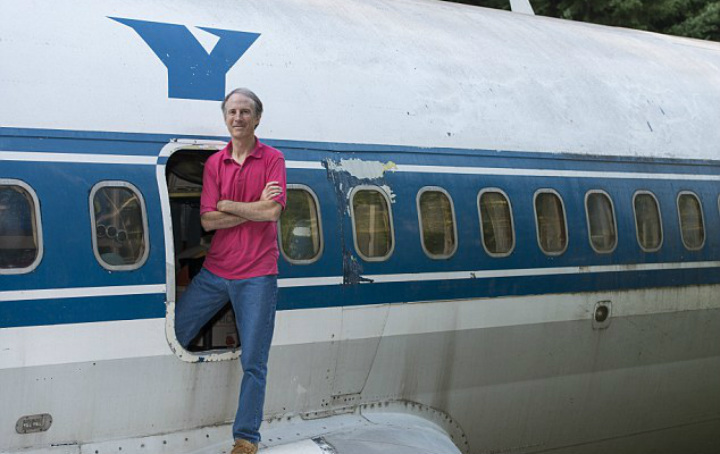 He is quite inventive and likes to transform old planes into wonderful upcycled masterpieces. It’s his belief that airplanes have much more potential than their intended use. 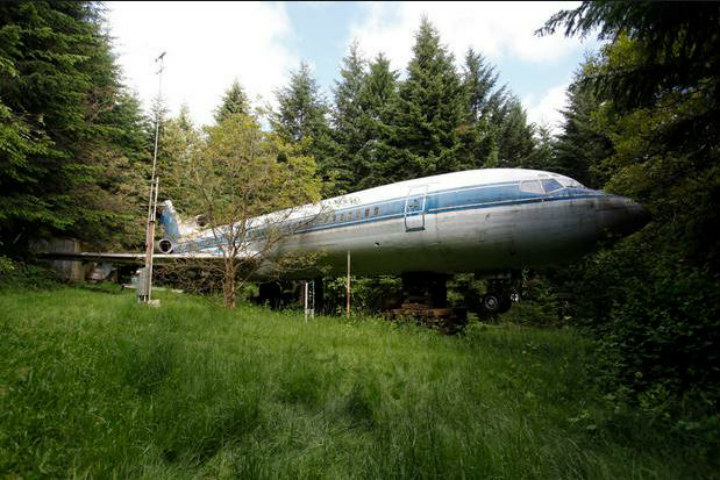 With his really good imagination, he has used an old airplane, which would have been turned into scrap metal, and a piece of land, into creating the most unique abode on Earth. 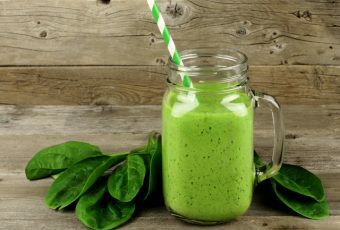 Let’s take a peek inside it! Retired electrical engineer Bruce Campbell is now 64 years old but he never lost his creative vision. 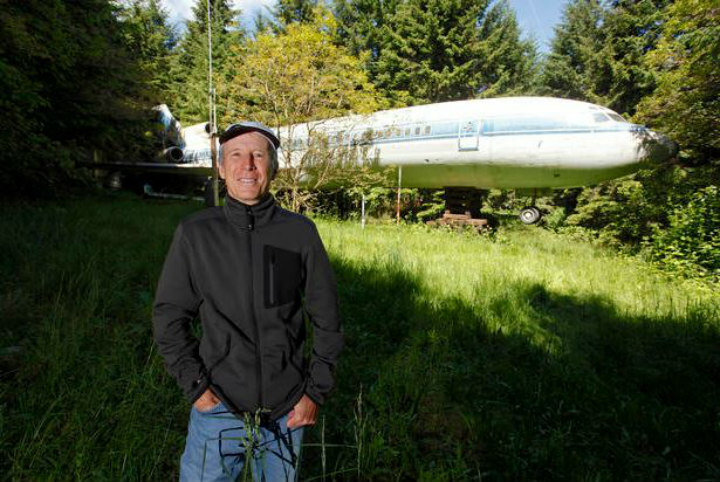 Back when he was still in his 20s, he bought a piece of land, which measures 10 acres, in Hillsboro, Oregon for $23,000. Although it is located deep in a forest, Bruce had in mind a really clear vision for his land. Even when Bruce was still a young boy, he already enjoyed tinkering with old things and materials in order to create new objects. 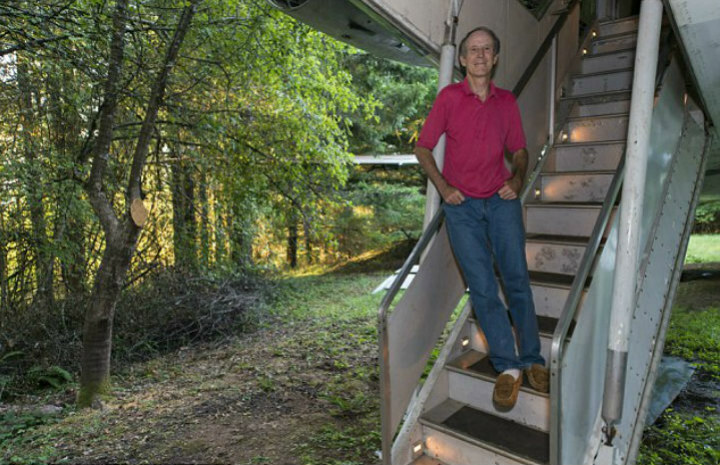 His initial plan for the land he bought was to build himself a home out of a few freight vans. At first, the plan had sounded wonderful and innovative to him, but then he got wind of a home another person built. 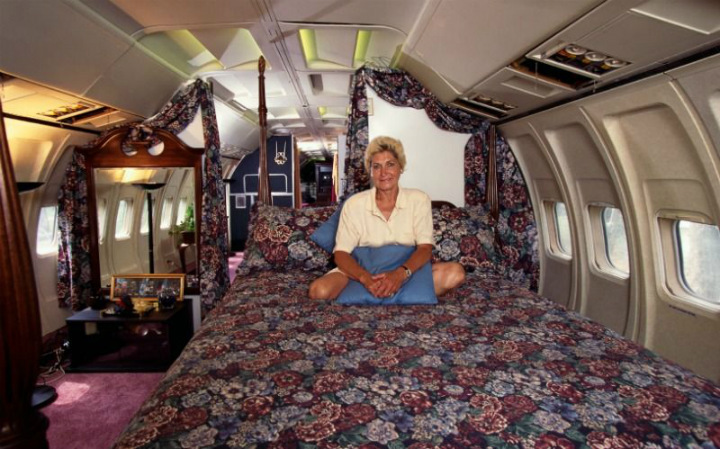 Almost twenty years later, Bruce Campbell found out about Mississippi-native Joanne Ussery, a hairdresser who purchased a Boeing 727 plane, which she converted into a home. She used to have a regular house but it burned down. Thus, she chose to construct an airplane home that is functional and located beside a peaceful lakeside. 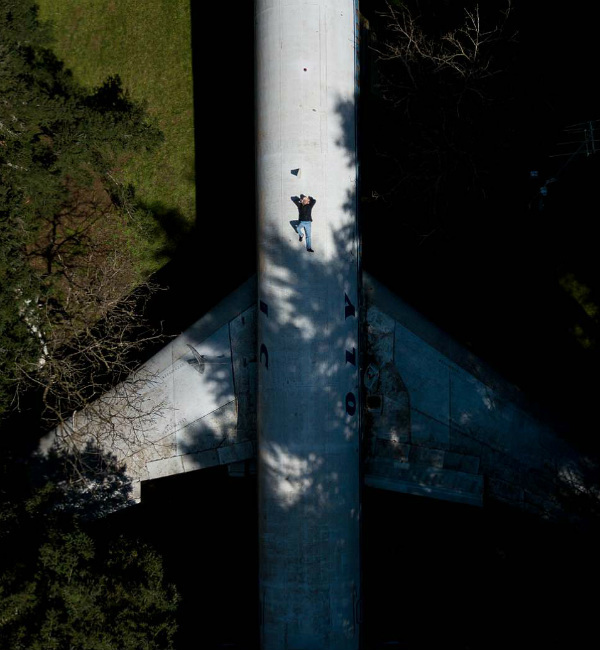 Bruce had already started putting his plan of building a home out of freight vans into action, but he supposed that it was far more innovative to use a gigantic plane. In addition, he thought playing with an airplane was more fun to do and he strongly believes that airplanes should not just be turned into scrap metal. There was no issue with the land because he already had 10 acres of it. However, he needed money to purchase and transport a plane to Oregon. Back in 1999, Bruce Campbell decided to buy a Boeing 727 aircraft. He purchased one for $100,000 from Olympic Airways, which was based at Athens Airport. 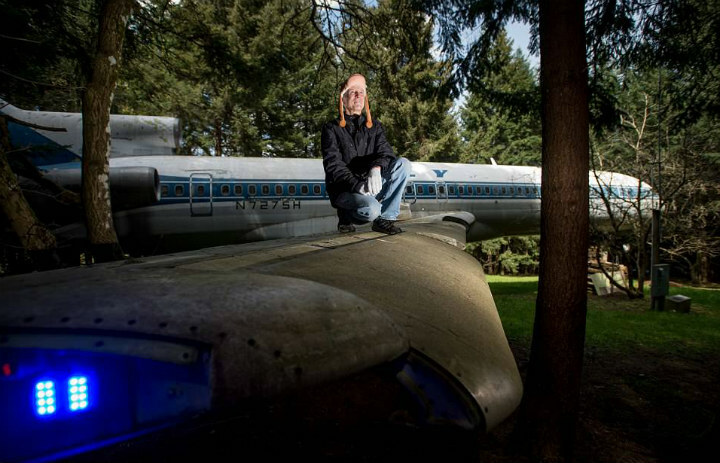 Once he obtained the airplane, he had to transport the gigantic aircraft to Oregon. Moving the airplane from Athens, Greece to the woods in Oregon turned out to be the task which is the most challenging out of the whole venture. Arranging for and completing the move, in addition to a few other details of the project, cost him another $120,000. This meant that the aircraft had already set him back $220,000 in total. Nevertheless, it seemed Bruce Campbell would get his money’s worth in many ways, more than he initially anticipated. Being quite an industrious man, Bruce Campbell was excited to start working on his project, which wasn’t just new but also quite large. 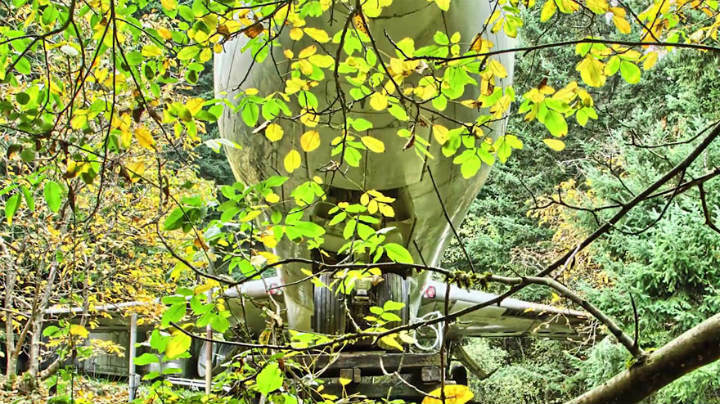 However, he first needed to move his Boeing deep into the Oregon woods. 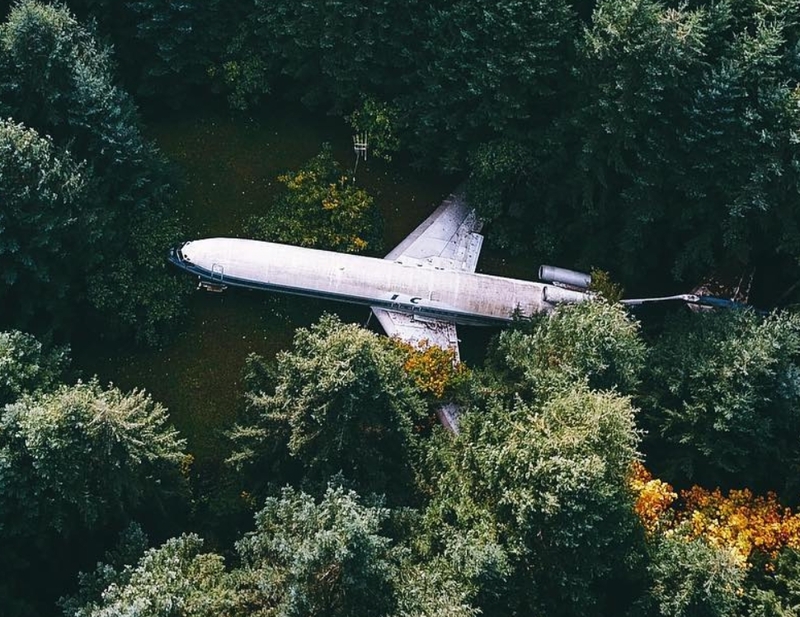 Several men needed to take apart the plane’s wings so that they could move Campbell’s new acquisition to the secluded forest. 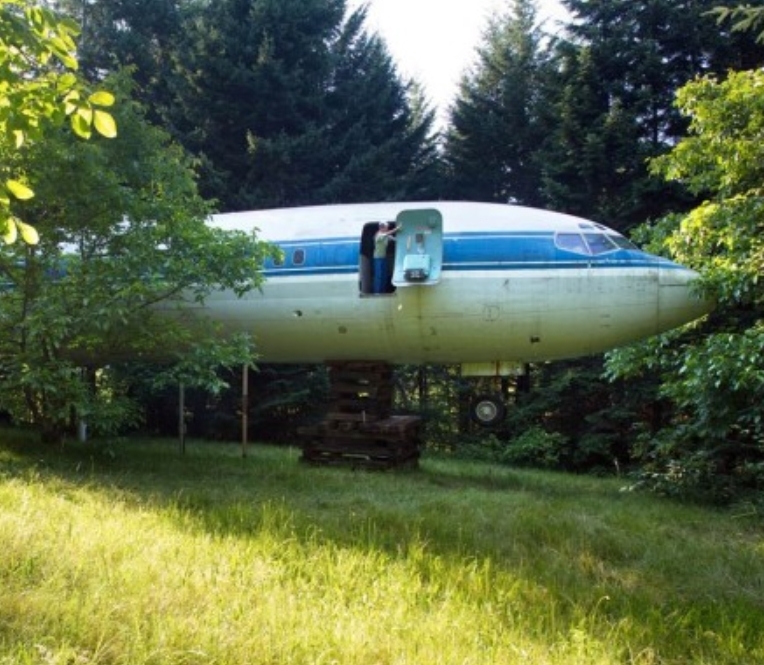 Many people have wondered how the authorities have allowed this man to plonk a plane in the middle of the woods. Well, this is because Bruce has ensured that the plot of land belongs to him. Talk about covering all corners. 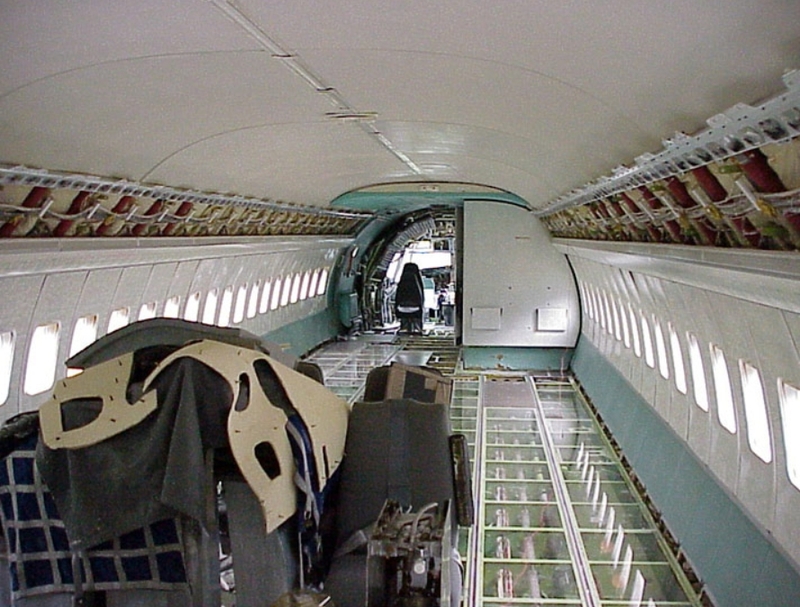 The wings had to be deconstructed in such a manner that Campbell would still be able to reinstall the parts once they finish parking the airliner in its new place. Campbell figured his new project would just begin as a “work in progress.” However, it ended up morphing into something so much more after several years of innovation and hard work. 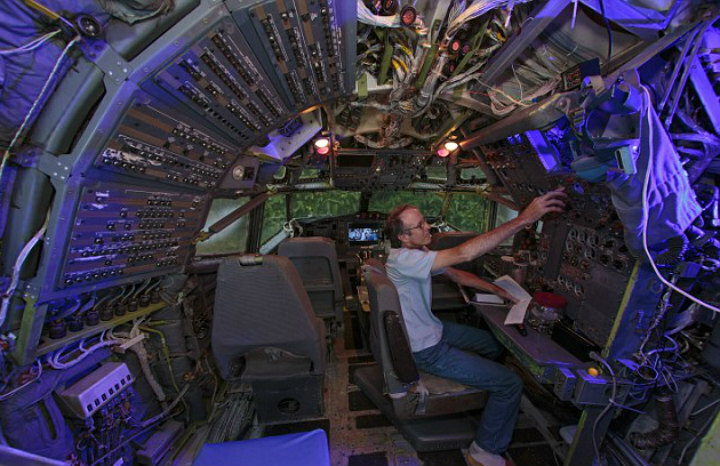 For several years, Campbell put in a lot of work on the fuselage while residing in the nearby freight vans. Relocating to the forest wasn’t easy, but he was a man with a mission and he wasn’t about to just give up. But he was faced with more trouble. After some time, however, mice infested the van. Campbell had no choice but to stay in the aircraft instead, even if he had no building permit. 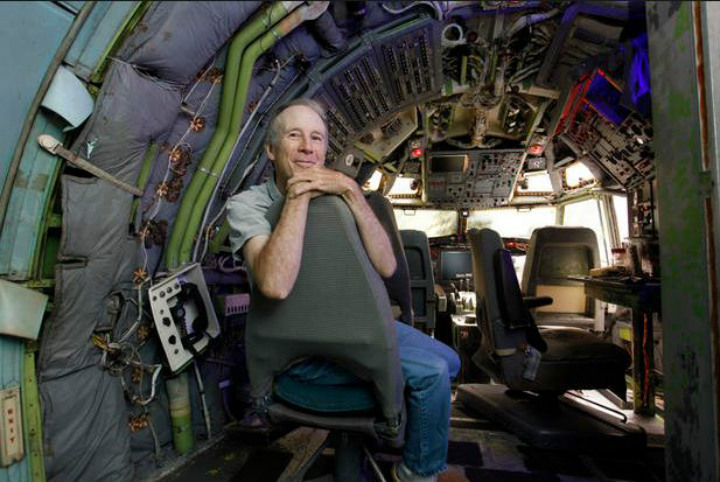 This was the time he began to genuinely understand the space, which is hard to imagine that it used to be a fully-functional airplane. Before debuting his masterpiece of an aircraft home, Bruce Campbell cleaned the fuselage’s exterior using a water spray with high pressure. He said to Daily Mail that although it may sound rather easy, pressure washing actually takes approximately four days. 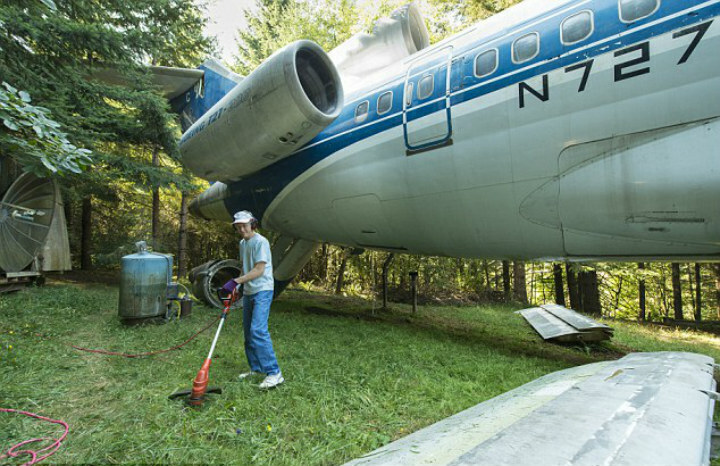 Every two years, the Boeing 727’s exterior needs washing. Bruce Campbell needs ladders to gain access to the plane’s top portion and the engines. It could actually be quite dangerous to wash his beloved home because he might fall or the water hose might swing unexpectedly. This fact makes him nervous. However, when you see the result of the things he did with the airliner, you’ll see why everything is worth it. 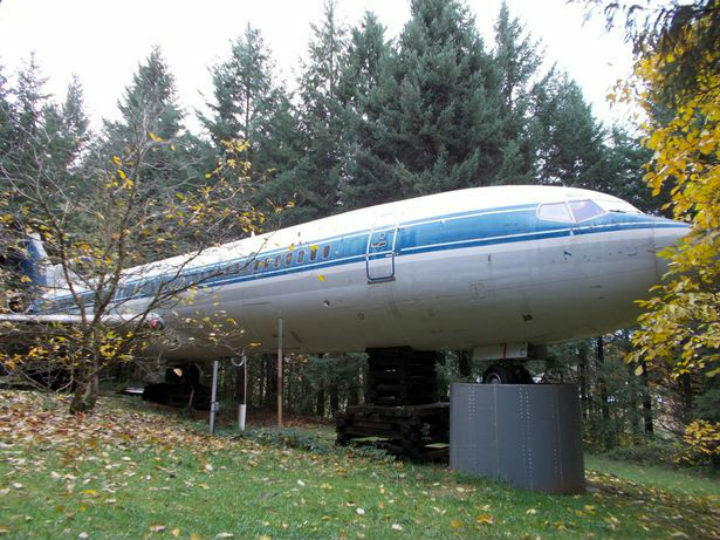 Certainly, similar to a castle, Campbell bolstered up his massive passenger Boeing 727 airliner with concrete pillars and installed a driveway for his aircraft home just outside Hillsboro, Oregon. 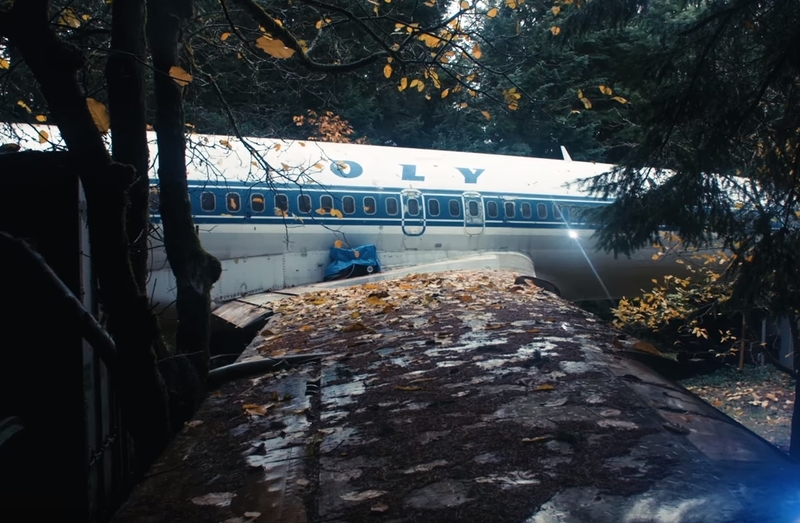 If people were to visit the area, they’d instantly notice the amount of work that has been done on the airliner and that it wasn’t by miracle the aircraft somehow landed there. Campbell did his best to use all the equipment that was already on the plane but he left most of the controls and instruments in the cockpit. 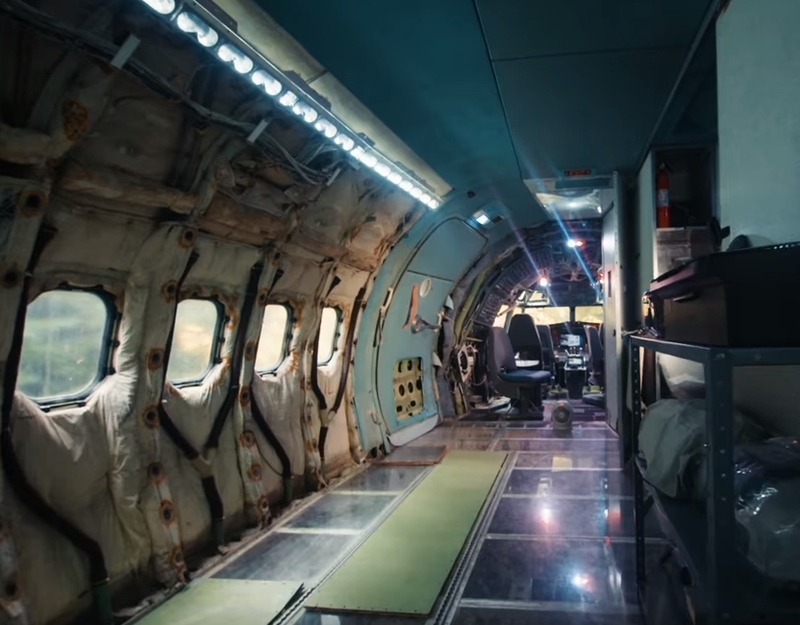 Nevertheless, he also updated things by modifying and restoring the aircraft’s interior to make sure it is fit for daily living. To Campbell, his new abode is a continuous work in progress as well as a fully-functional home. 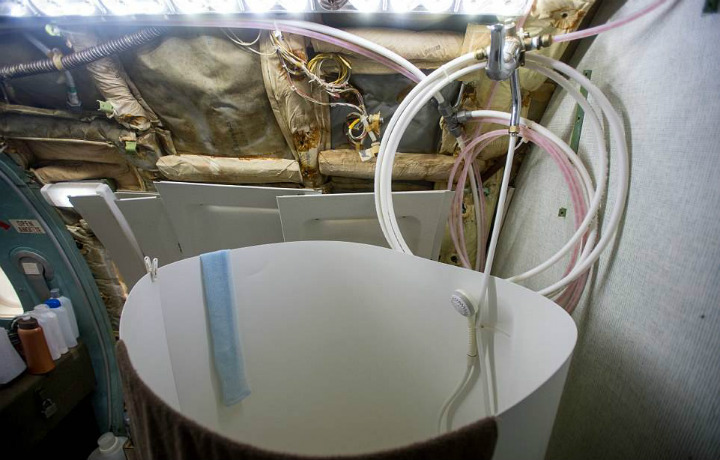 The shower may be makeshift and something he built himself, but he also worked to restore some of the original features such as the flight stairs, LED lighting, the airplane-style lavatory, and part of the seating which originally came with the airliner. 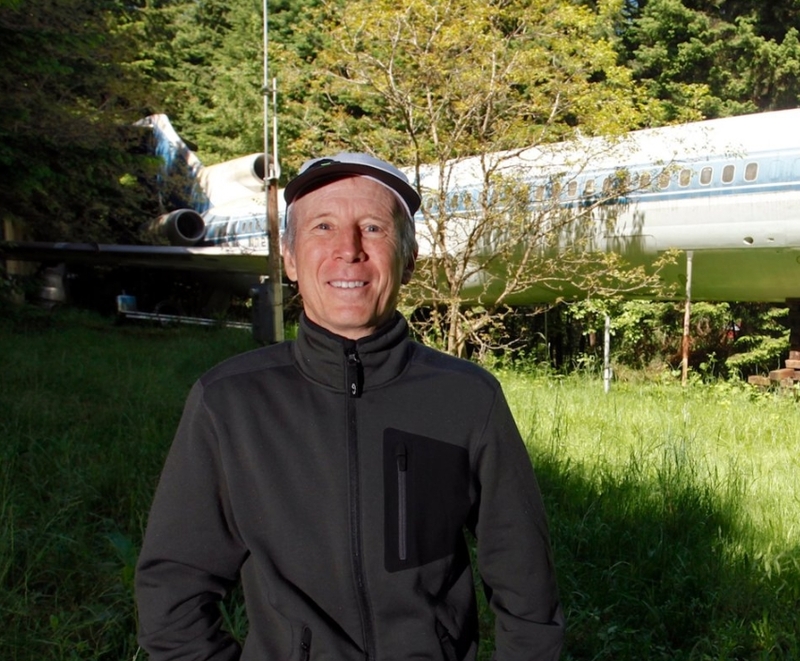 Curious to know what his airplane home looks like today? 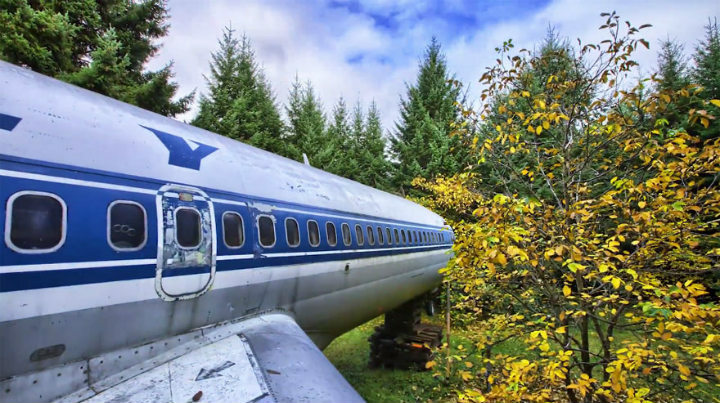 As people enter Bruce Campbell’s jetliner home, they have to use the aircraft’s original fold-down stairwell, pretty much like what they would have done when the Boeing 727 was still used regularly by people and on an airport’s tarmac. He seems to have thought about every last detail. 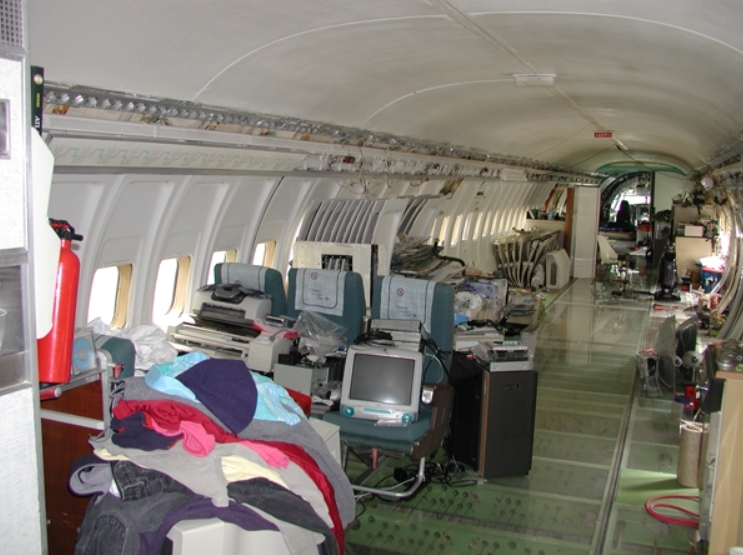 For example, at the front area of the plane, there is a shoe rack that is filled with many pairs of slippers which are ready for visitors to use when Campbell welcomes them into his home. 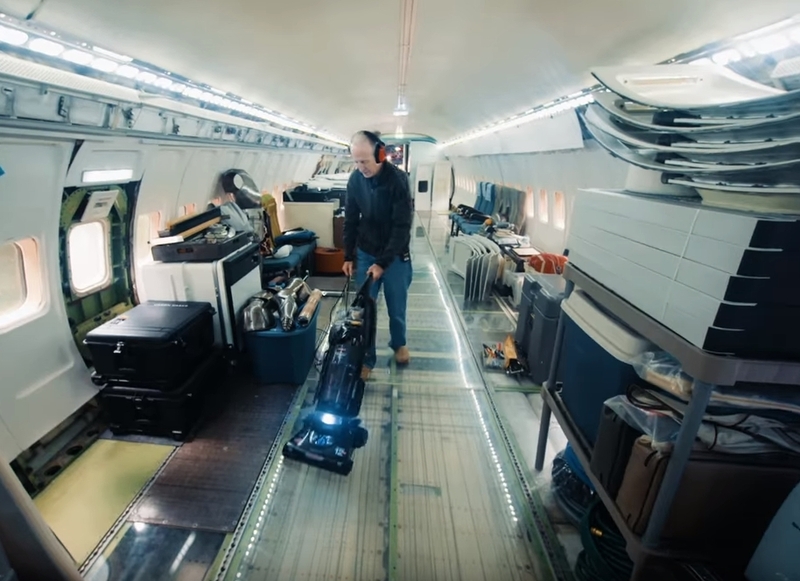 He would rather have people wear slippers and socks inside the aircraft to maintain its cleanliness since the housekeeping of such a huge home isn’t very easy. 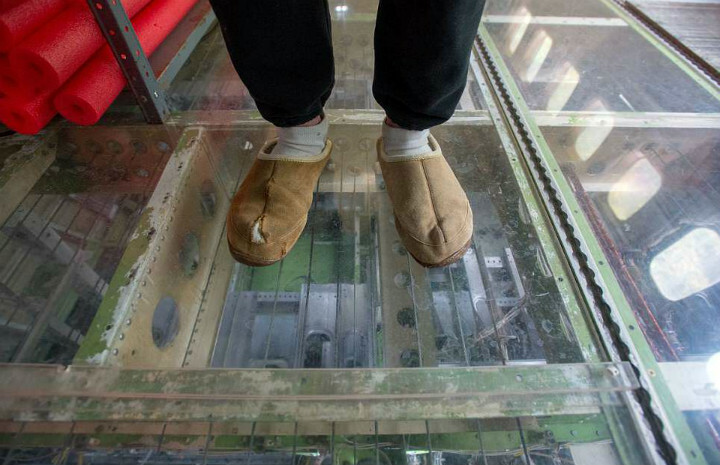 Having seen the glass floor getting dirty quickly due to the surrounding forest, he always sticks to his sock/slipper rule to make sure that the airplane stays in pristine condition. Despite the fact that he lives alone, he still takes pride in the home he has created for himself. 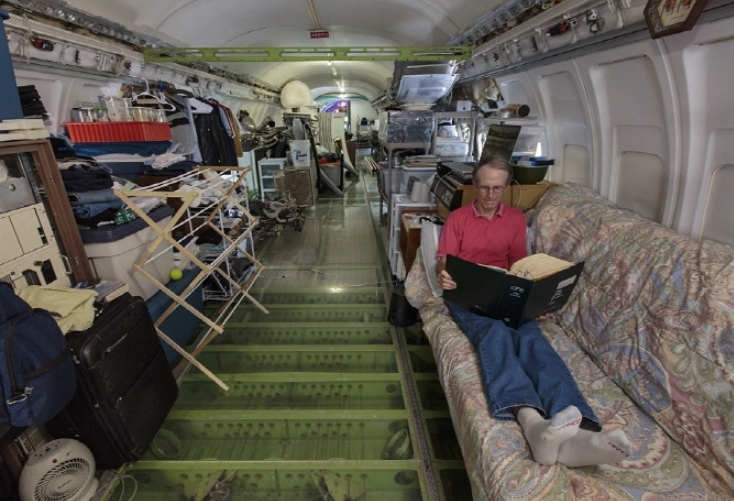 Campbell himself only wears socks and slippers to move about in his rather unique airplane home. He adores the Plexiglas flooring – something which adds to his home’s overall look. 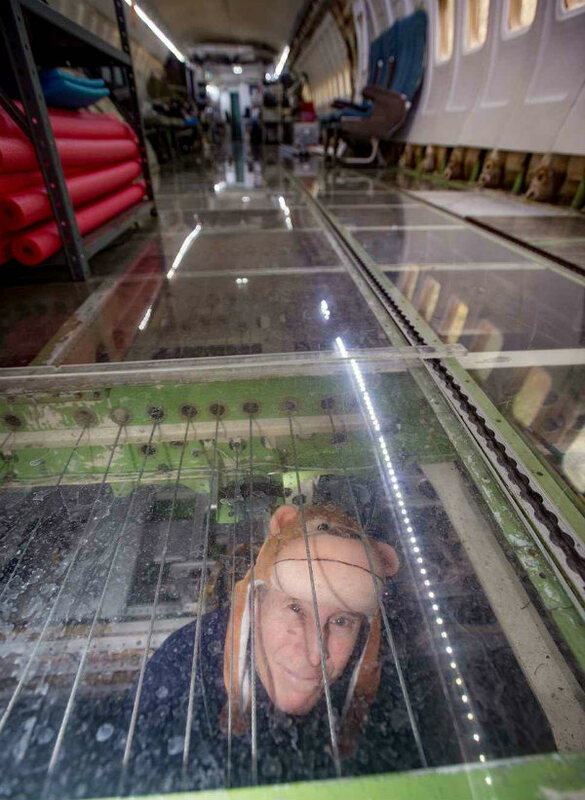 Standing on the glass, he often imagines more things that he can possibly do with the airplane. 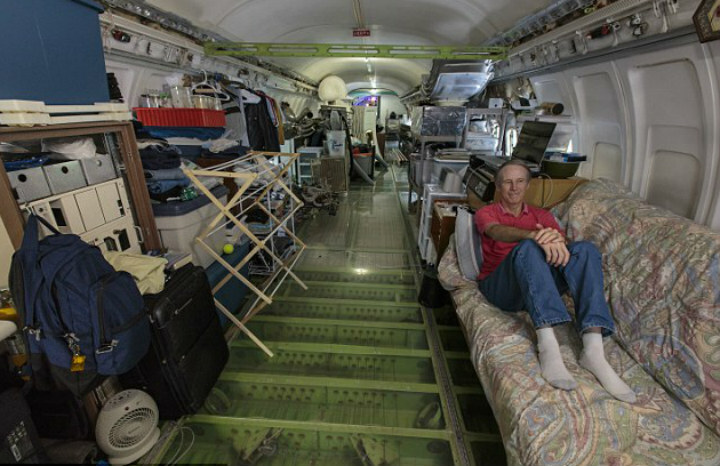 Although there is plenty of space on the retired Boeing 727, Bruce Campbell actually leads a rather modest lifestyle on the plane. 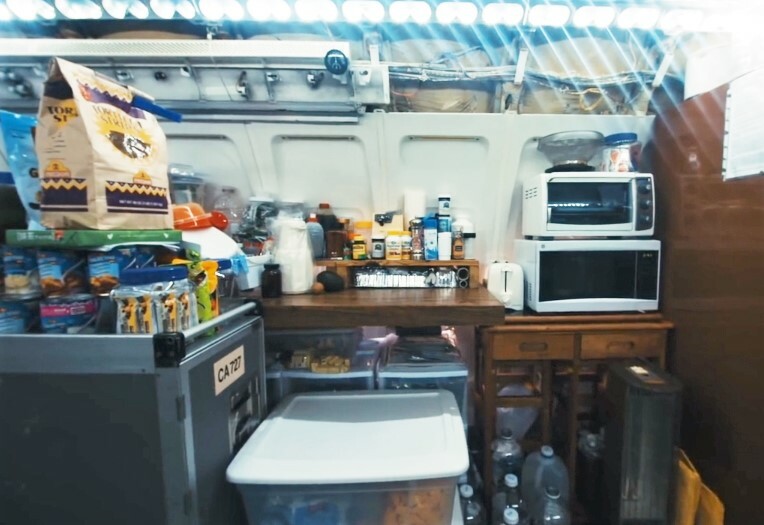 He only has a futon to sleep on, cooks using a toaster and microwave, eats mostly canned food and cereal, and constructs plenty of makeshift equipment. In the picture, Bruce can be seen relaxing on his futon and surrounded by plenty of his possessions. 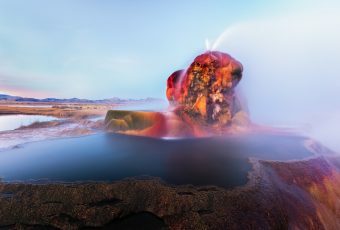 However, during the time he isn’t chilling, he is hard at work, renovating certain features of his home like the bathroom. Keep reading to find out about it. 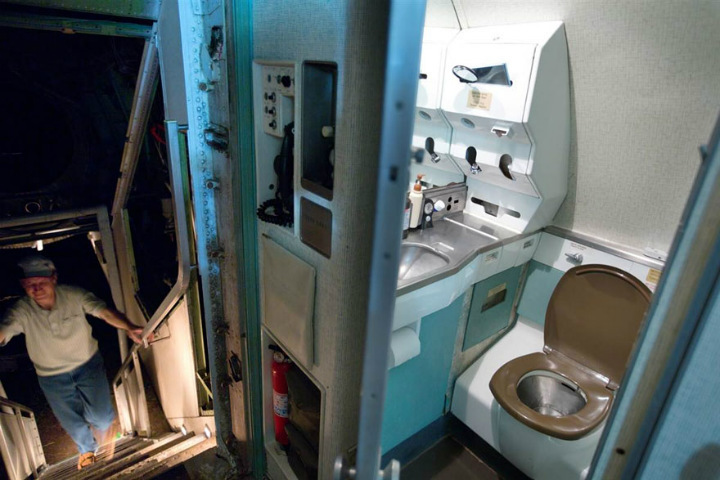 There are actually two original working lavatories on the aircraft, but the coolest feature would have to be the shower that Campbell constructed near the plane’s tail. 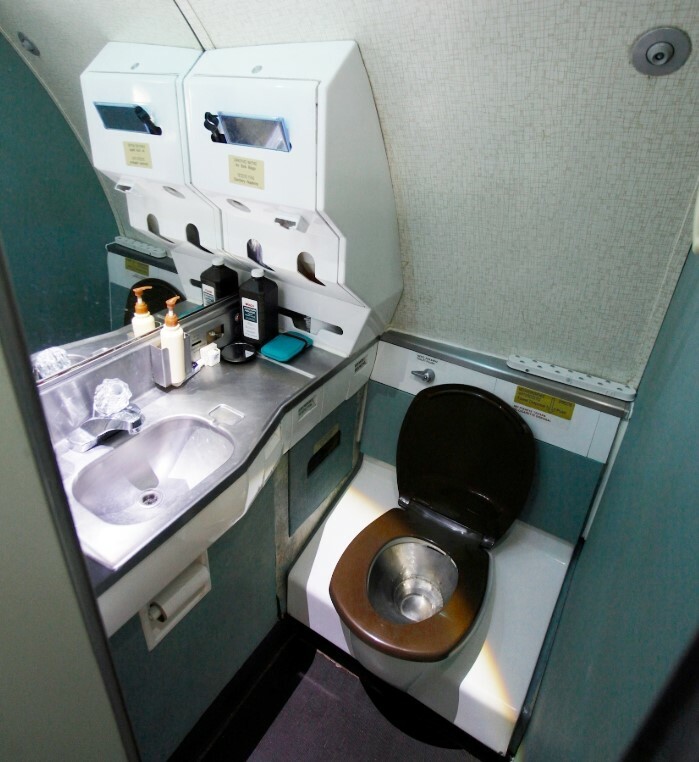 In order to have access to running water on the plane and to have electricity for heating up the water, Campbell dug a trench where a rerouted well power line leads to. He connected the old cable for power to an old meter base. He then installed a brand-new circuit breaker cabinet on the airplane. Campbell also added a PVC conduit (tubing), a water pipe for backup, and a telecom cable. This enables him to shave and brush his teeth with clean water. 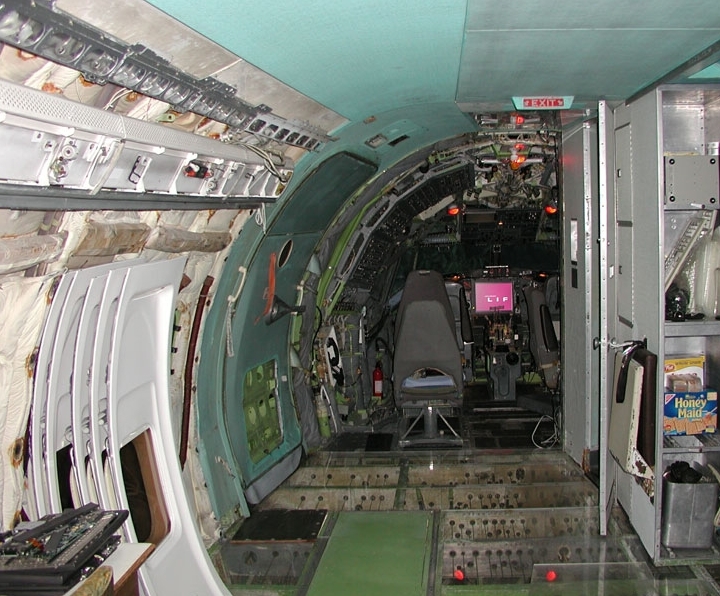 The cockpit of his Boeing 727 still features all the original instruments. However, Campbell has converted the space into an entertainment area, where he also does his reading. 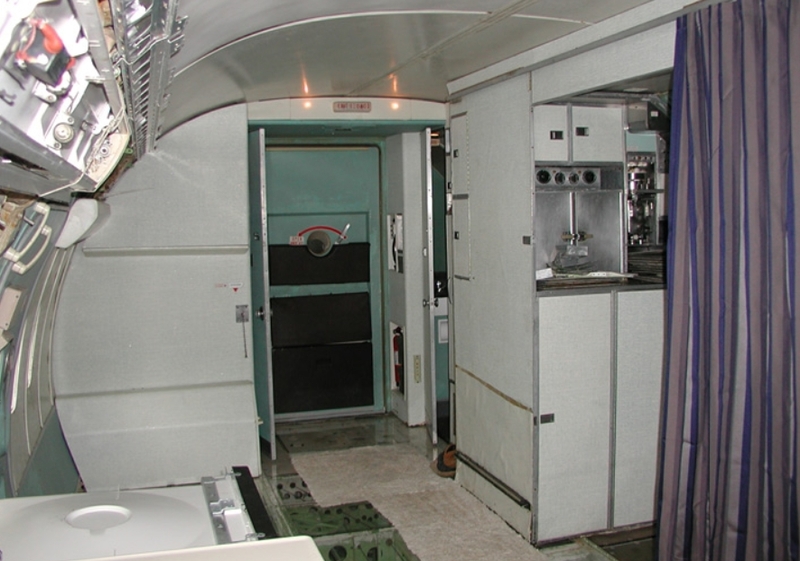 This part of the airliner is what he constantly would like to renovate and improve owing to all the interesting gadgets. It is not unnatural for an engineer to desire living in and working on his project at once since that’s probably the best way to be able to have a true understanding of the space and how to make it the most functional. In addition to constructing his very own system for running water, Campbell also repaired the lighting inside the plane and outside it. He anticipated that it wouldn’t be easy to live alone deep in a forest. Thus, he made sure the basic amenities he needed were covered. This means that his airplane home is fully operational even at night. He doesn’t have to worry about possible power cuts in his plane. Campbell can do some research, work, and read all throughout the night. 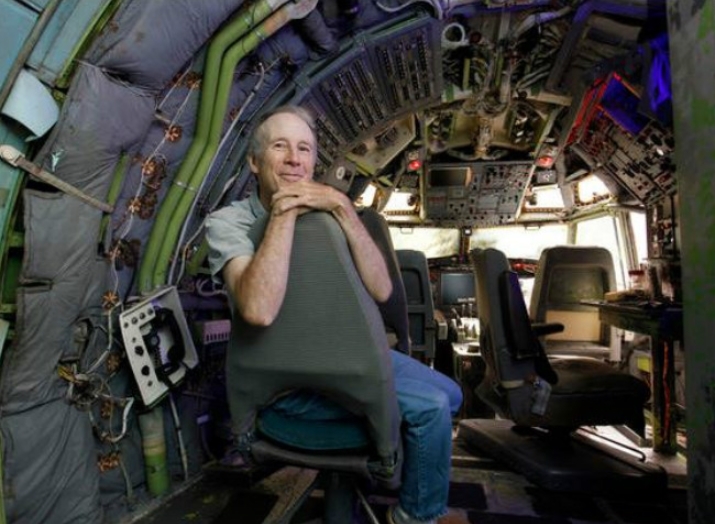 He restored the plane’s original LED lights that are actually more environmentally friendly. 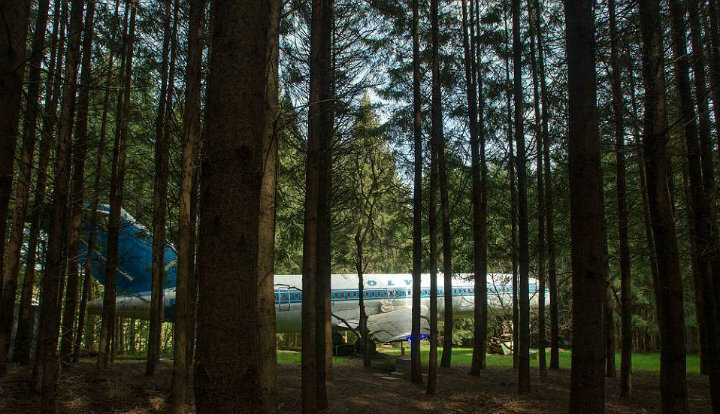 Bruce Campbell does not just take care of his airplane’s interior, he also looks after the forest area surrounding his Boeing 727. Similar to people tending their yard or garden, Campbell does the same to the grass and weeds around the airliner. He mows the grass once a week and also picks pull up the weeds underneath the airplane to make sure that the area is presentable always. This is not an undertaking, but it seems nothing is ever impossible for a man like Campbell. 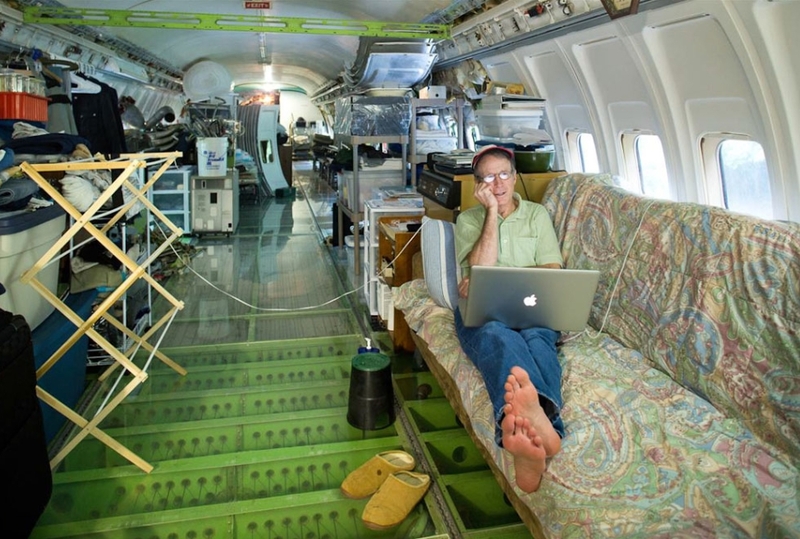 In an interview with the Daily Mail, Campbell was asked about his reason for strongly believing in upcycling an aircraft and converting it into a home. 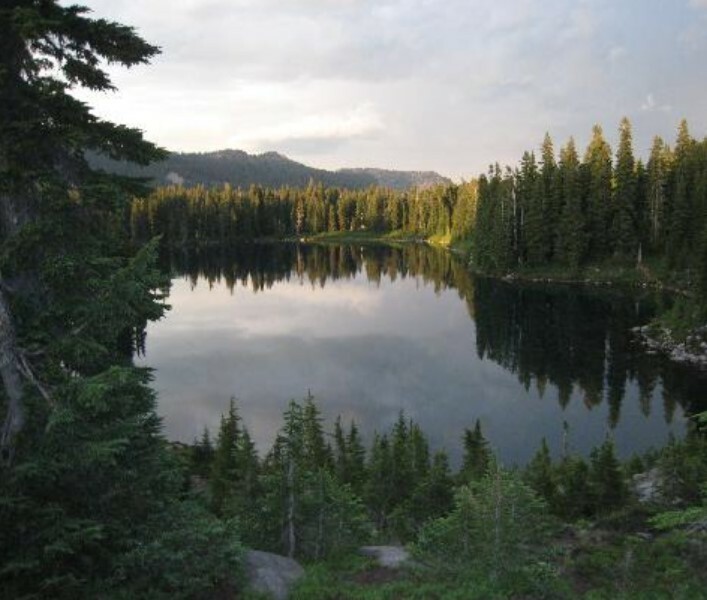 He emphasized that such an endeavor has a range of environmental benefits. He also noted how strong and durable airplanes really are and he said that they are even able to withstand earthquakes and storms. 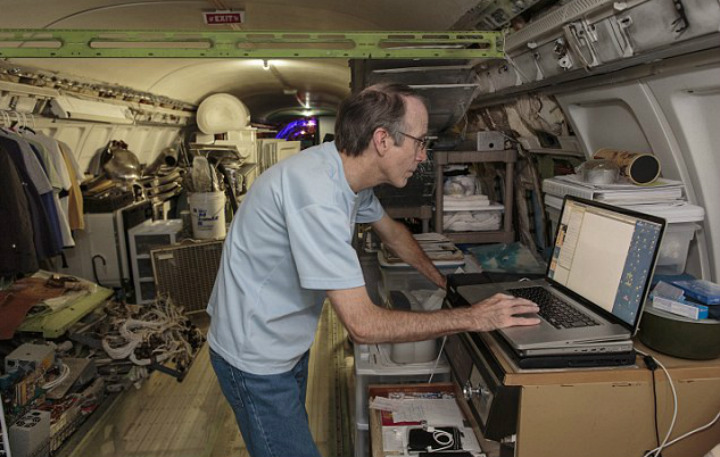 His Boeing 727 is not only able to weather a storm. 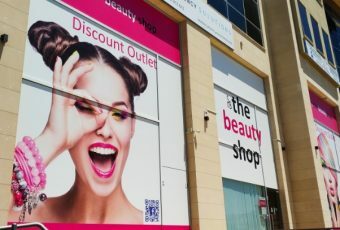 It is also relatively easy to clean and maintain. “Their interior is easy to keep immaculately clean because they are sealed pressure canisters. They could last for centuries,” Campbell said. 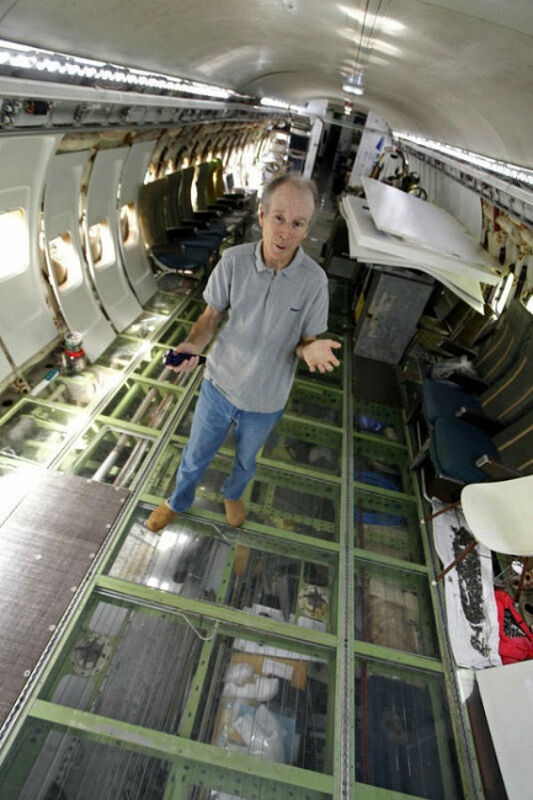 He also believes that transforming airplanes could gain traction all over the world if people come to see the environmental benefits. 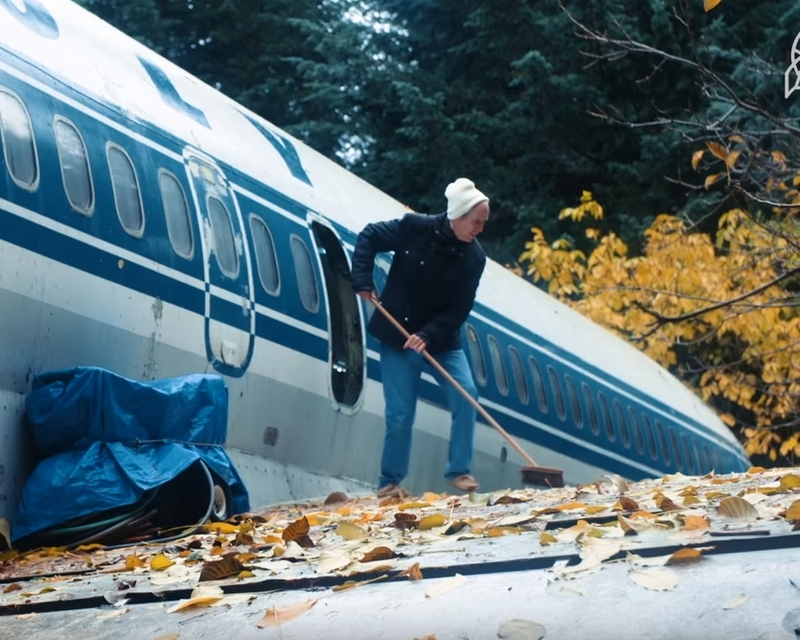 Some people may be unwilling to live on an airliner due to the lack of supplies and amenities, but Bruce Campbell is proof that it’s just not the case. Since the city isn’t far from where he lives, there is really no issue getting supplies. 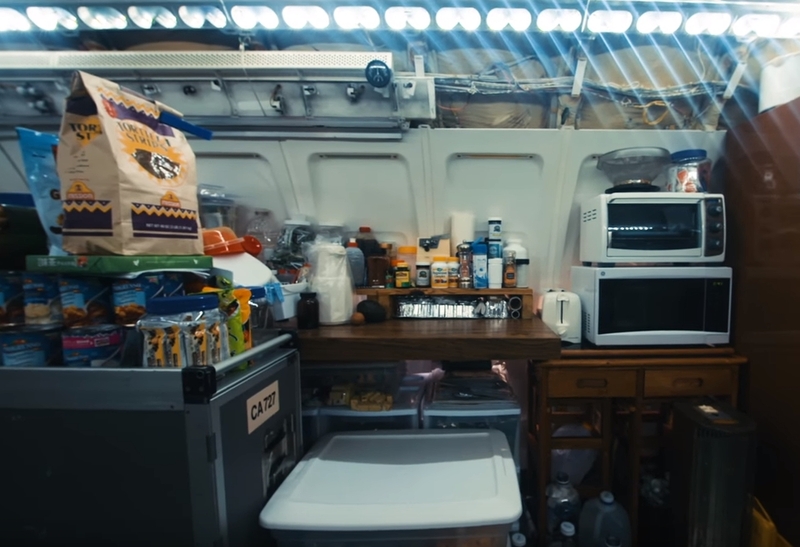 As can be seen in the photo, Campbell’s kitchenette is fully stocked with practically all that he needs. He has supplies, condiments, and produce. It might not be easy for him to make a gourmet meal. However, he seems like someone who prefers to feed the tech soul in him rather than feed his tummy anyway. His kitchen has a microwave, toaster, and running water, so whipping up basic meals is not that hard. 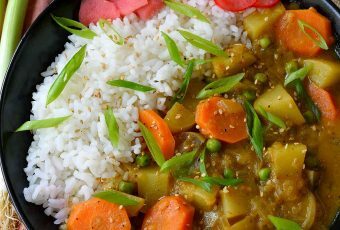 Definitely better than eating airplane food, right?! 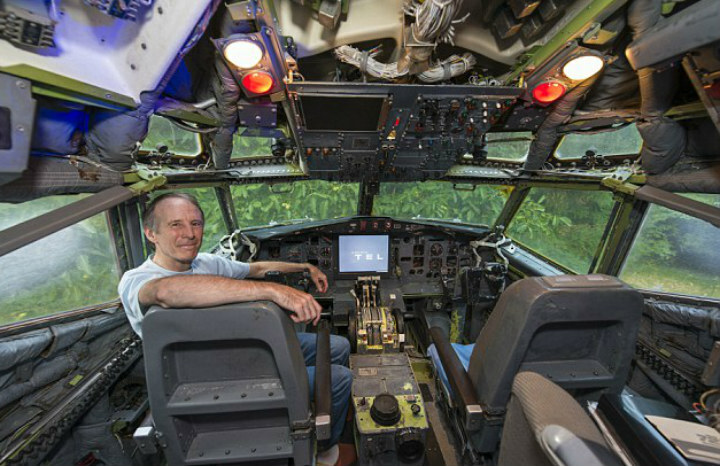 Taking out his Boeing 727 for a test flight might be impossible for Campbell to do, but the rows of preserved seats in his home still gives that feeling. Their original form hasn’t been changed, and hence preserved the feeling of excitement that flying in the air gives. Only a few of the seats are left because most have been taken out to give him space to live in and move around. 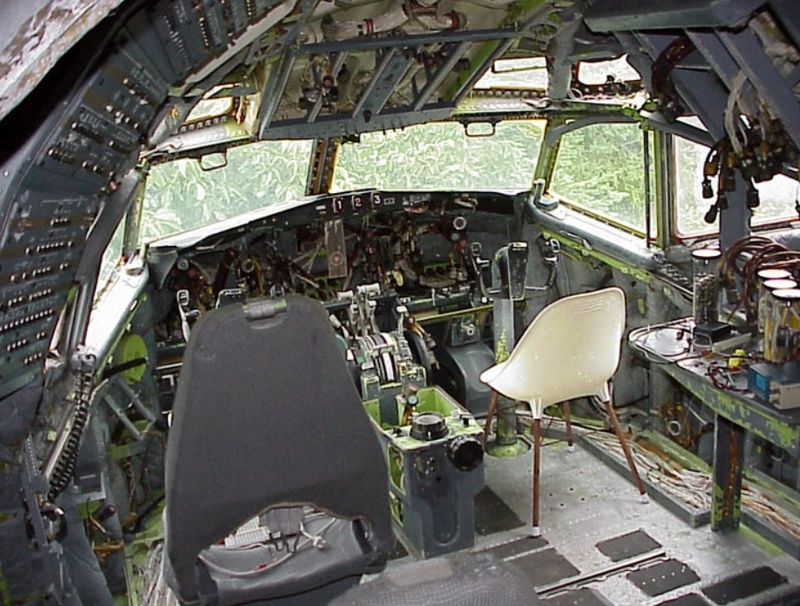 However, he decided to keep this piece from the original plane so that he could be reminded the reason he loves his unique home very much. Besides, guests are welcome to chill in the seats as much as they want. Campbell adores spending time in the plane’s cockpit area. It is where he gets his creative juices flowing. In addition, it provides a nook to relax, read, and unwind. It also serves as his very own game room. 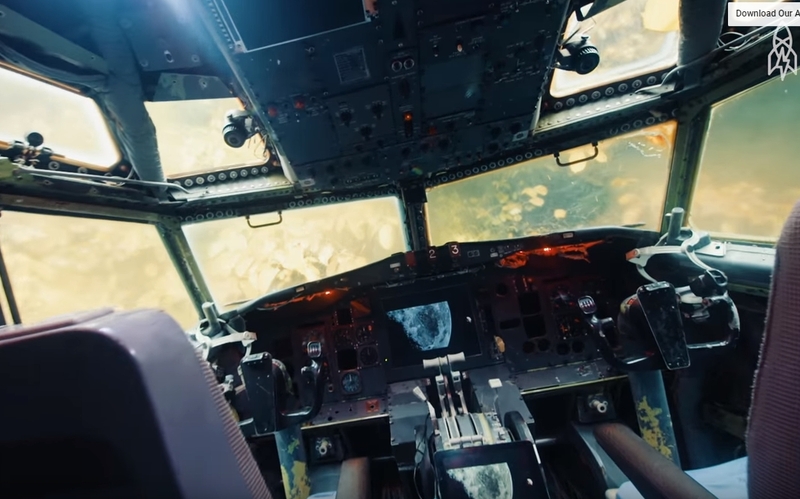 When he sits in the cockpit, Campbell is given a chance to imagine what a pilot feels like during a flight with all the flashing lights and gadgets in front of him or her. Technology, in all its glory, is brought to life here. On the topic of hygiene, Bruce Campbell also has it covered. He uses clean running water when brushing his teeth and even has a top-loader type of washing machine to ensure his clothes look clean and smell fresh. Campbell is proof that all people need is a little imagination along with some skills, and practically anything can be turned into a makeshift home. So this means if he can do laundry, there is no reason for you not to be able to do the same thing. 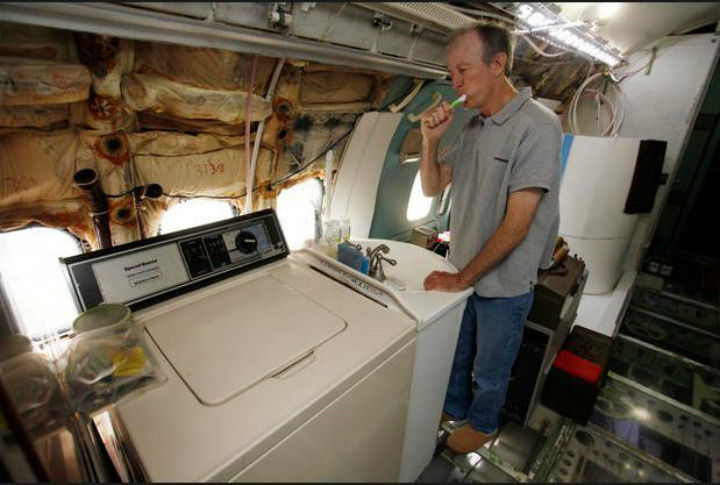 Even if Campbell lives in a Boeing 727, he still looks after himself and takes care of his appearance. As a matter of fact, the interior’s meticulous design only reflects how clean and neat he really is every day. Campbell isn’t marooned on an island nor is he isolated from civilization. This means he still showers, shaves, and cleans himself on a daily basis just like other people. 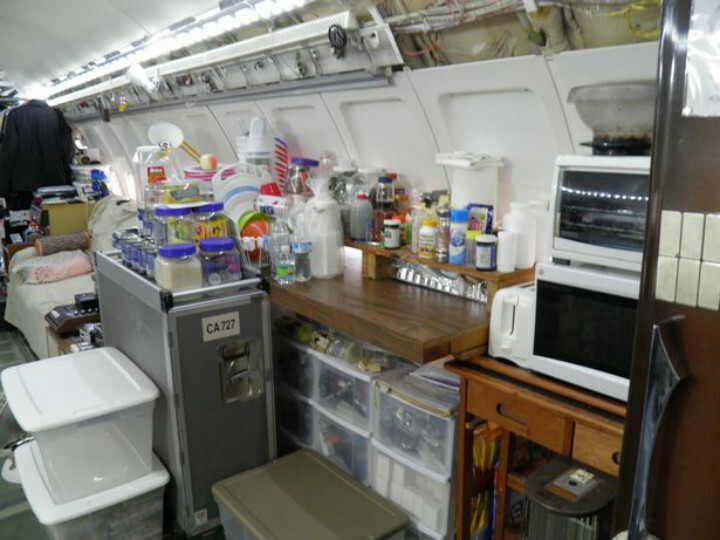 His airplane home basically has everything he needs. He is convinced that traditional rectangular homes are, in actual fact, inferior since they go for ergonomics rather than strength. “To me it makes no sense at all to destroy the finest structures available and then turn around and build homes out of materials which are fundamentally little better than pressed cardboard, using ancient and inferior design and building methods,” he said. 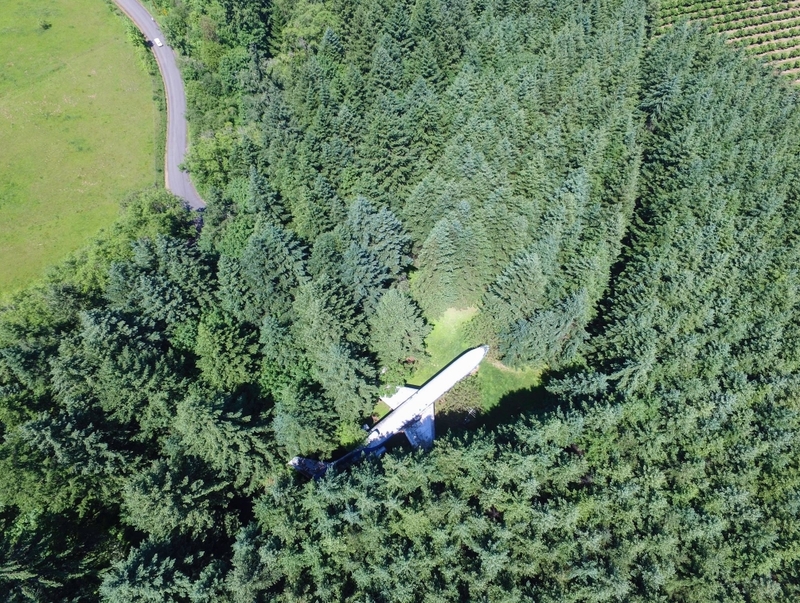 Many people ask Campbell questions like whether the airplane crashed in the woods in Oregon and whether he simply reconstructed the plane’s body. Actually, he doesn’t care about queries like those since he said they’re completely unreasonable and illogical. His goal is for the world to learn the amount of hard work that goes into projects like this. 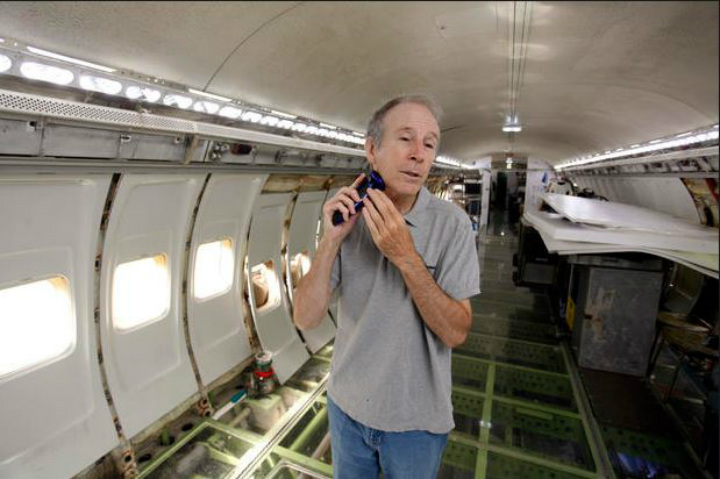 He thinks it’s odd that people don’t comprehend the intricacies behind the aircraft home that he has built. However, he also understands the fact that some people are unaware of the possibilities. 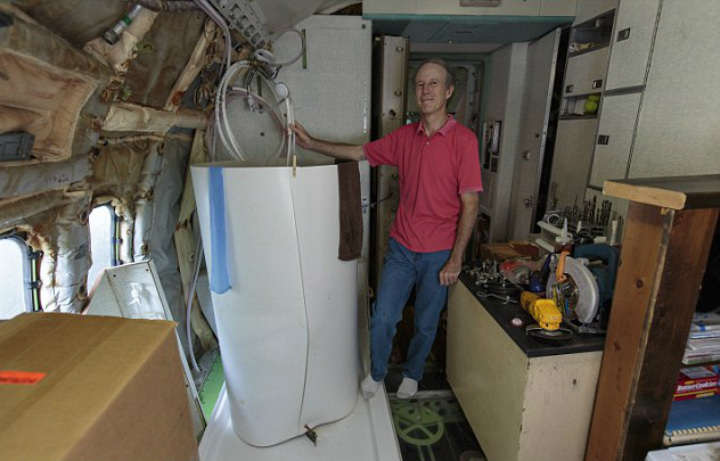 Posing for the camera in his Boeing 727, he feels extremely proud of what he has done to his home. 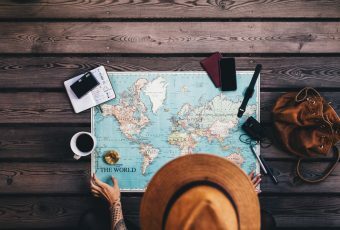 There is no place like home, and for Campbell that rings true especially when he is aboard this airplane where he has the chance to play with different gadgets and toys and at the same time feel inventive always. This is only one feather in Campbell’s innovation hat since he has even more creative and bigger plans for the days ahead. Keep reading to find out what’s next for Campbell and where it might take him. 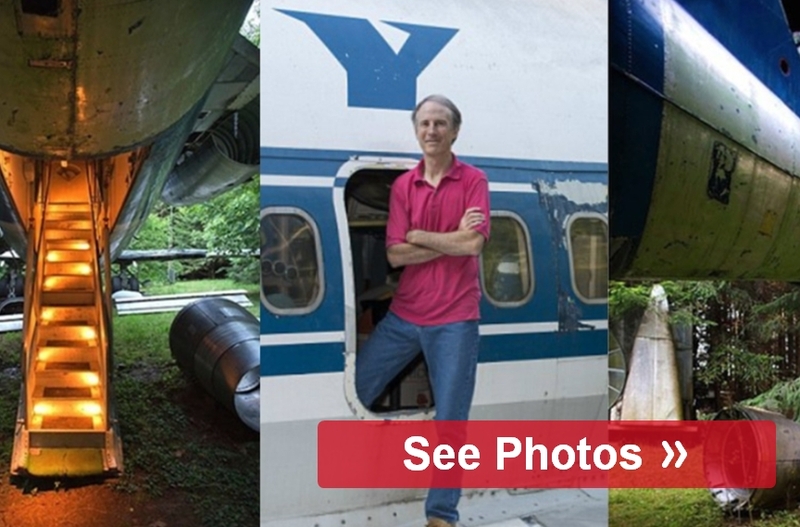 It might surprise you to learn that Bruce Campbell resides in his aircraft home for only six months each year. He prefers having a change of scenery. Thus, for the other six months of the year, Campbell lives in Japan – rather different from his living situation in Oregon. During the time he resides in Japan, he works on several ideas and projects to keep busy. One venture, in particular, has caught his interest. It may be hard for you to believe what the venture is … or perhaps you can guess. That’s right! 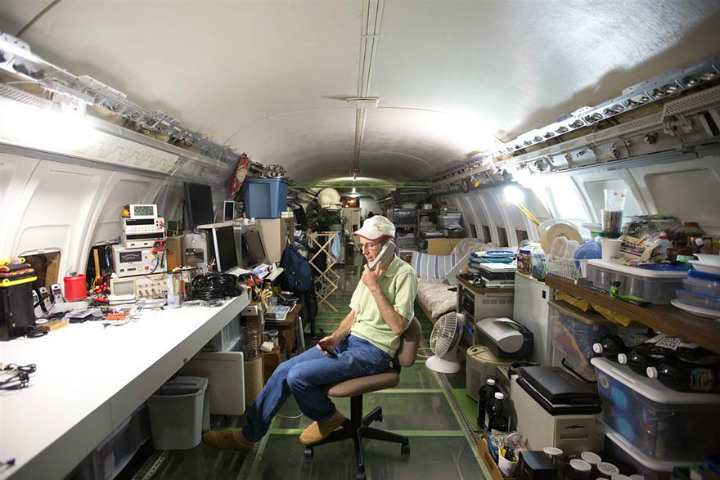 Campbell plans to duplicate his project once more, but this time around, it’s going to be in Japan with a bigger airplane – the Boeing 747. 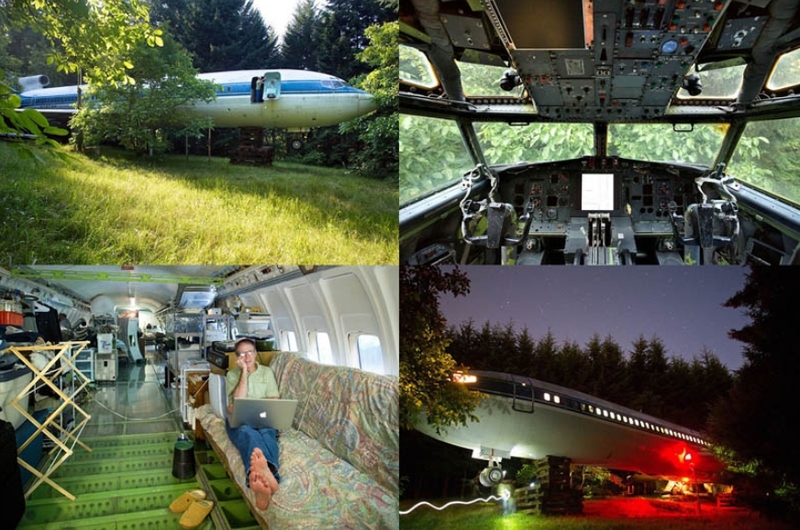 He is planning on purchasing a retired 747 aircraft and turning it into another quite unique home for the time when he is in Japan. Since he helped save the environment in the country he lives in half of the year, it makes sense that he would also do the same thing in his other country of residence. 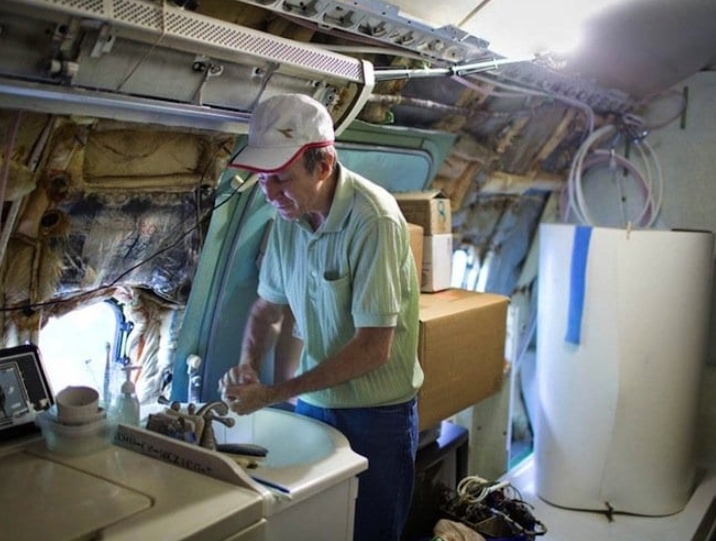 Now that he has done a restoration of one airplane, doing the same for another one seems to be quite easy for him. Campbell is convinced that his purpose in life is to create a significant and positive impact on the world – for the environment and humanity. He is driven by innovation. This is most likely because for the better part of his life, he was an electrical engineer. The organization AFRA concentrates on promoting practices for aircraft and engines which are sustainable. Another spokesman determined that around 1,200 to 1,800 airplanes will be dismantled all over the globe in the coming three years, while approximately 500 to 600 aircraft will be retired annually over the next two decades. Those numbers could translate to number of homes if more individuals start learning from the example Bruce Campbell has set! The engineer didn’t purchase a home until much later in his life. 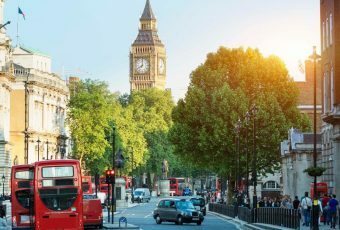 In an interview with the Daily Mail, he explained that he didn’t want to get a mortgage since he felt that he will get financially restricted if he had one. When he did finally have enough money to buy a home, he had in mind a completely different idea. 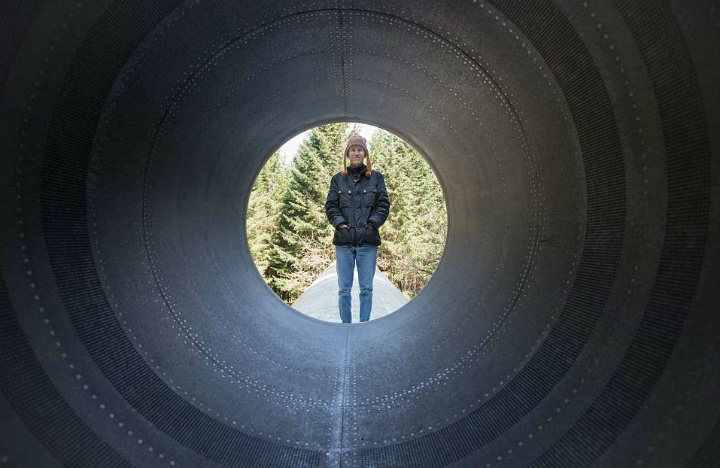 “I had stopped thinking in provincial terms and I had thought like a free bird engineer,” he said. Tourists and curious onlookers can stop by and have a tour inside his abode because Bruce Campbell is glad to let them do so. 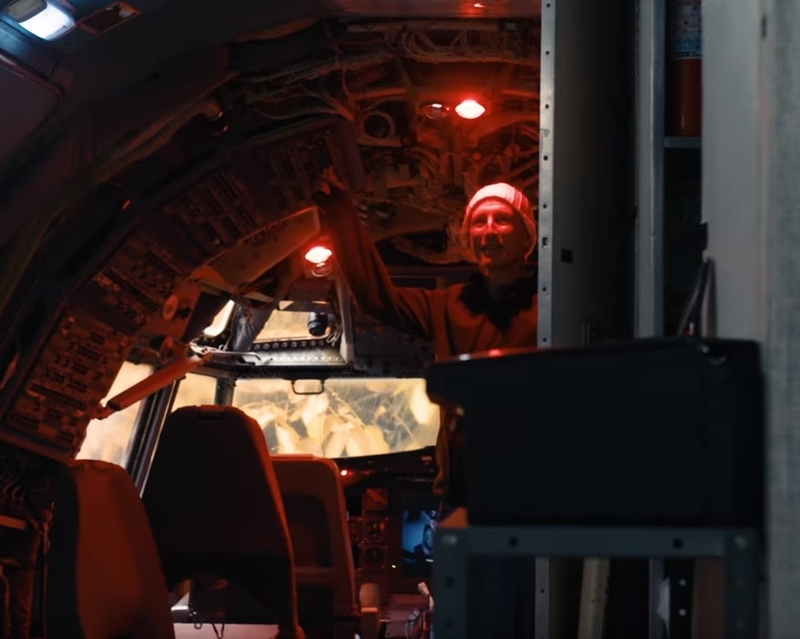 People can even set up appointments with him through his website if they’re in the area and are curious to see or know what residing in an aircraft is like. 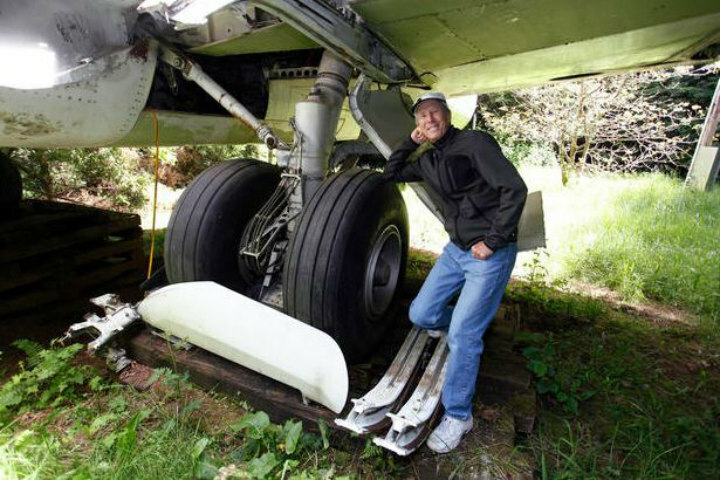 Since he frequently gets quite a few visitors dropping by to have a tour of his awesome Boeing 727, some awkward moments have occurred. There was one time when Campbell had been taking a shower and a few onlookers walked in to tour his home. 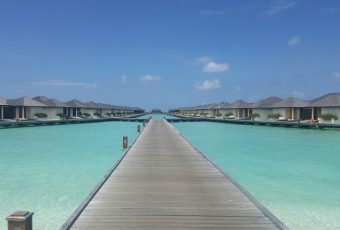 Campbell said that about 75 per cent of the visitors arrange a schedule with him first via his website. However, the rest just randomly arrive at any time. “I live in a pretty transparent environment. 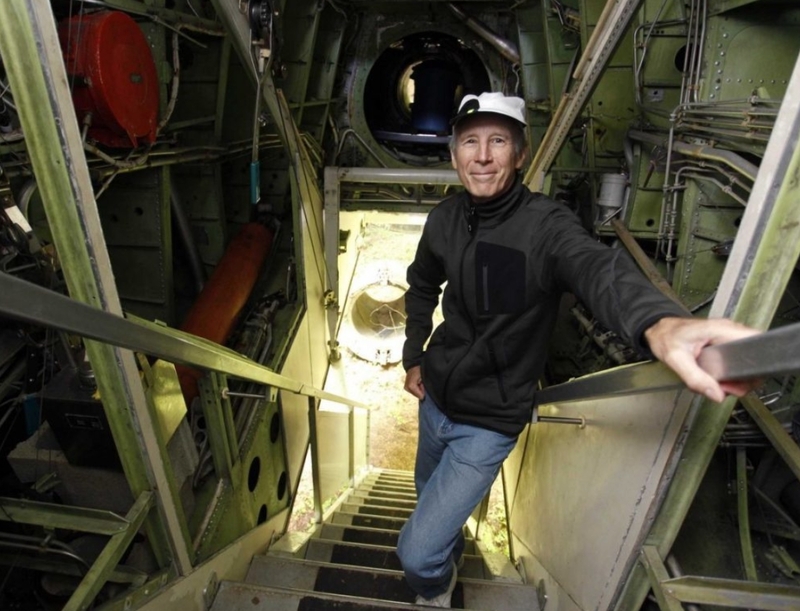 I go about living while people are touring my aircraft and sometimes it’s very intimate,” he explained to Daily Mail. Despite this, he finds it very rewarding since he gets a chance to meet interesting people and learn many things. Aside from Campbell opening his house to some inquisitive guests, he also holds many events all throughout the year. From June 30th to July 3rd in 2018, he hosted Tokyo vocalist Pomily and other artists in a one-of-a-kind show. 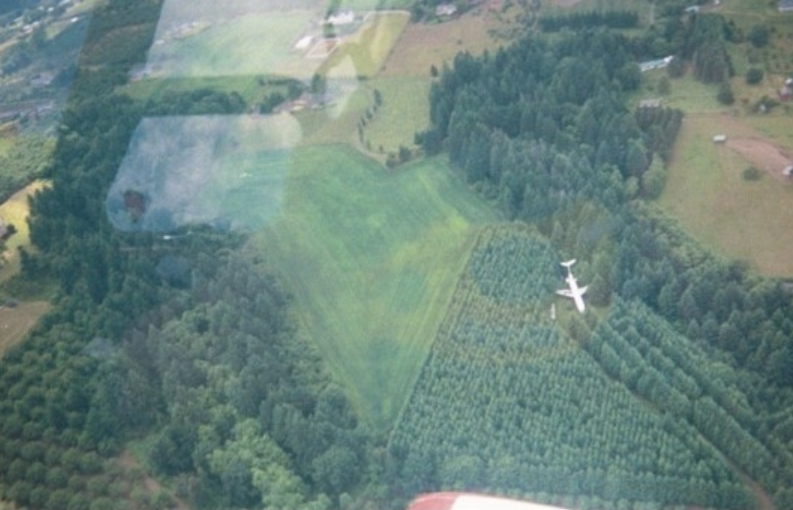 The concert took place right in front of the aircraft’s right wing where a grassy area could be found. On his website, he advertised the event as “A new concert option: Superb music rendered from a wing of a scintillating aerospace home” with a few instructions and guidelines. Campbell gave the guests advice to come in running or tennis shoes and some comfortable clothing suited for the countryside. He even offered slippers to the people who wanted to enter his aircraft cabin. For those who missed the last event that Bruce Campbell hosted, he is hosting another one which is a huge DJ dance party along with some friends. His friends own the party promotion company in Portland called Murderboat Productions and the music event is from September 7th to September 9th, 2018. 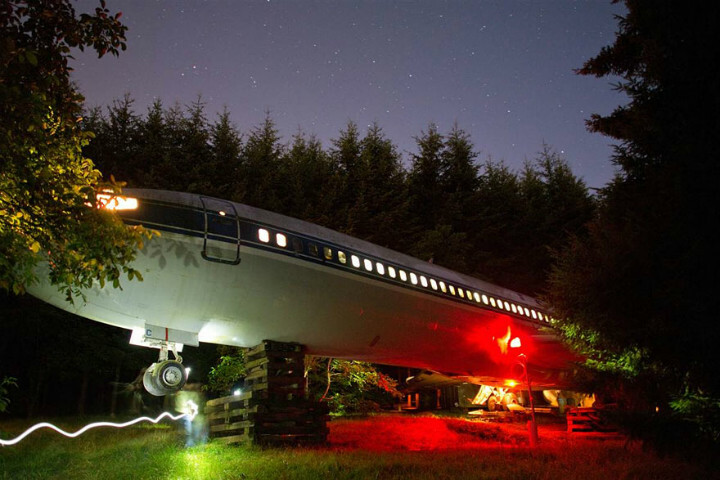 Called Turbulence: A Dance Party at a 727 in the Woods, the party is taking place on the wing. In addition, the guests who will come to party with them on the ground can tour the aircraft as well. So far, over 14,000 people on Facebook have shown interest for what seems to be quite an unforgettable party with food, beer, and art – of course, with the Oregon Liquor Control Commission’s permission. His modest lifestyle does not leave Bruce Campbell wanting for more. He is content living in his very own inventive bachelor pad, so he isn’t really keen on giving it up. He’d much rather not pursue love instead. “I will not marry and will not generate kids. I’m 68 so it’s too late anyway, but I simply never desired to be married or have kids. I enjoy romance and love and I indulge in it as much as civilization will allow,” he told Daily Mail. He absolutely loves his unconventional home, which somehow explains why he thinks the traditional concept behind love and marriage is as limiting as a mortgage. On the other hand, he is quite close to his neighbors who support the things he does and completely believe in the vision he has. What’s more, his outspoken ambition certainly wasn’t deterred by his modest life. This brings us to his next project which is in the works at present. 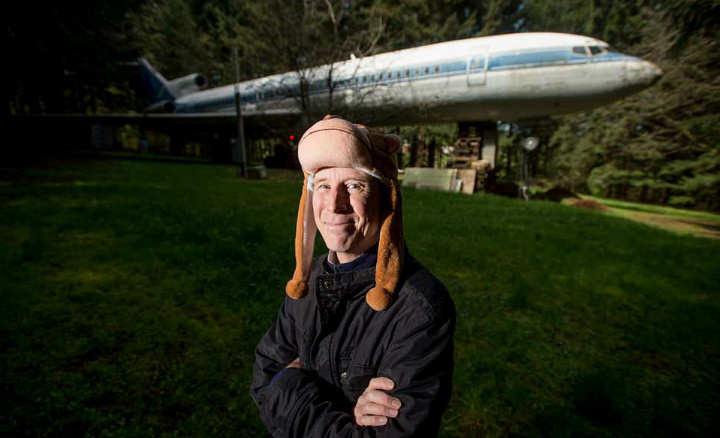 He divides his time between residing in his Boeing 727 home in the forest of Oregon and living in Japan, where Campbell hopes to buy some land to be able to create the second airplane home he wishes to own. This time he’s planning to use the bigger Boeing 747-400. 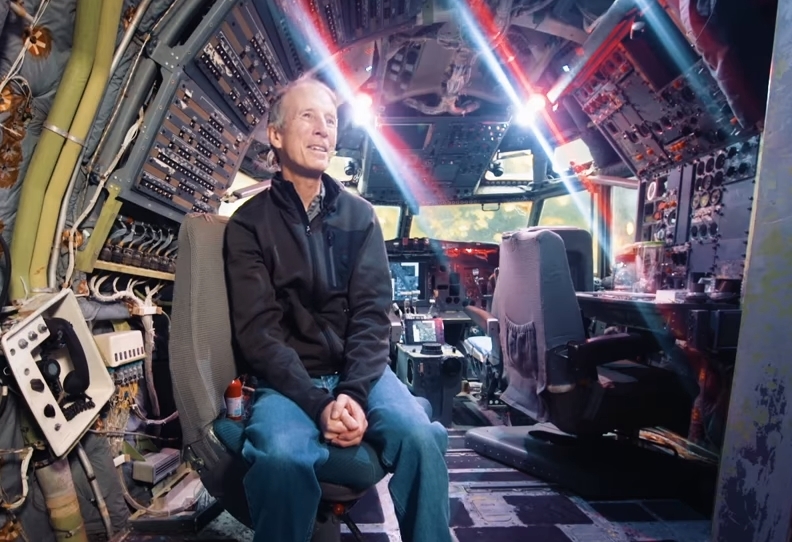 Campbell simply loves the thrill that he gets when he upcycles airplanes and he believes that other people will have the same feeling once they pay his plane a visit for open tours and social events. On his website, he wrote that to “spark a renaissance of thought about how to utilize this remarkable resource” is his goal. 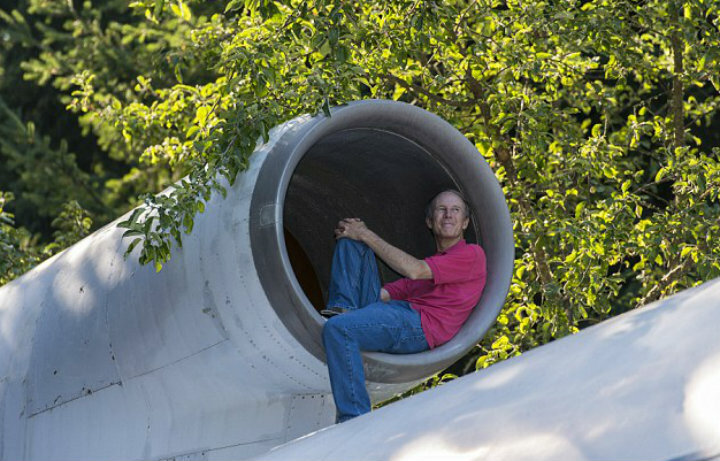 Campbell desires to see others starting building their own aircraft homes as well. The talented engineer is planning to begin working on his second airliner home in the early part of 2018 on the coast of Kyushu Island. He decided on this location since he would like for his home to be a haven for him and the local community. Campbell’s vision is to convert this airliner into a lifeboat for places that get regular tsunami threats like Kyushu. 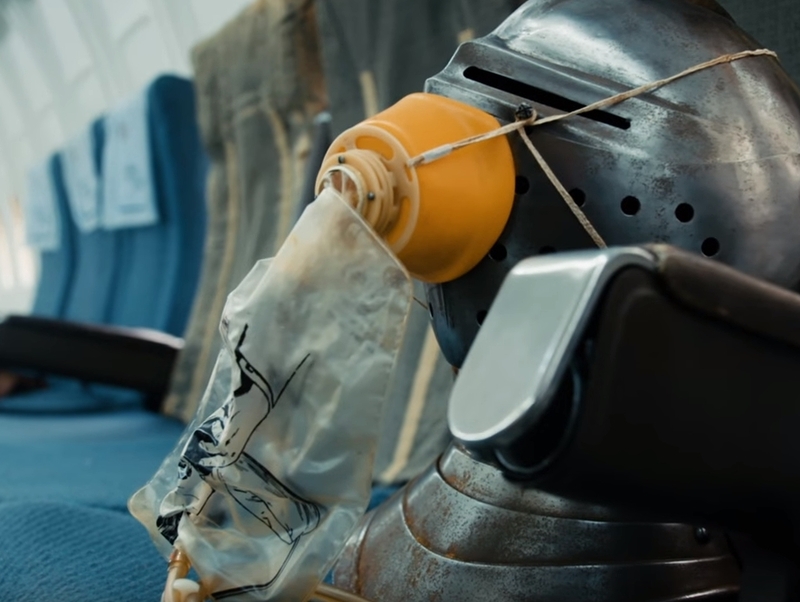 He would like the general public to learn that planes can last for hundreds of years and they are able to withstand the harshest of conditions because of the airplanes’ sealed pressure technology for high aerospace. 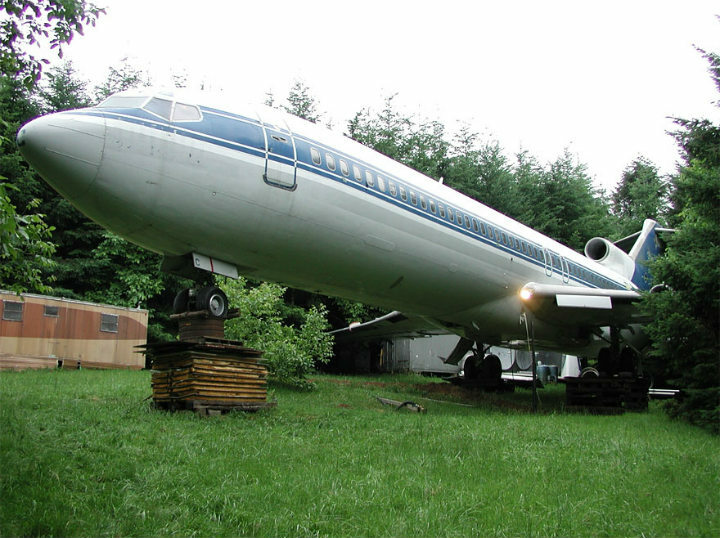 The airplane that Bruce Campbell used to create his Oregon home is a Boeing 727-400, which Boeing produced from 1960 to 1984. The plane model was constructed to serve flights which were short and medium-length since the aircraft could use relatively shorter runways at some smaller airports. 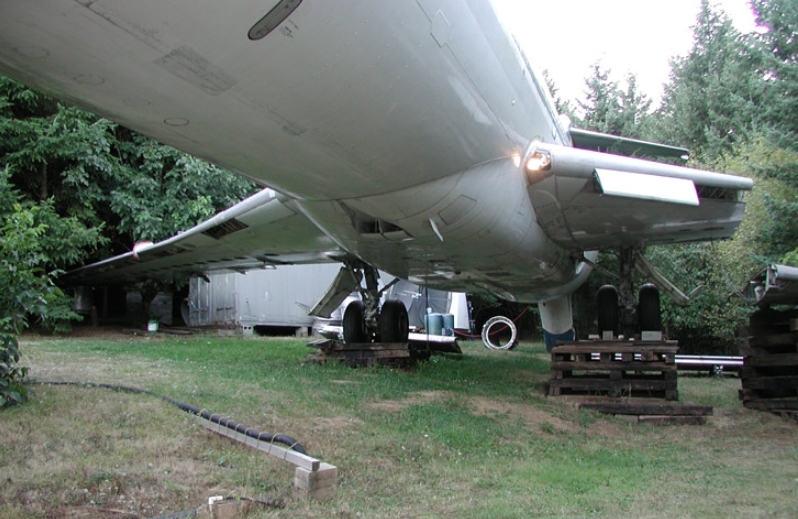 This airplane is the only airliner model that Boeing Commercial Airplanes constructed with three engines. It has seating for around 149 up to 189 passengers. The last major carrier in the U.S. to use the aircraft model was Delta Air Lines. 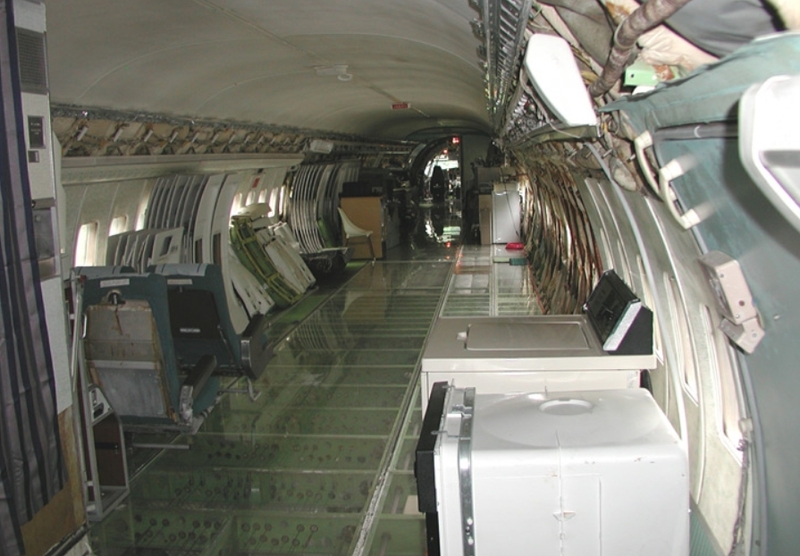 The last Boeing 727 of the carrier was retired in April of 2003. On the other hand, Northwest Airlines retired their last Boeing 727 in June of the same year. Today, the only carrier that still operates 3 Boeing 727-200s for passenger services is Iran Aseman Airlines. 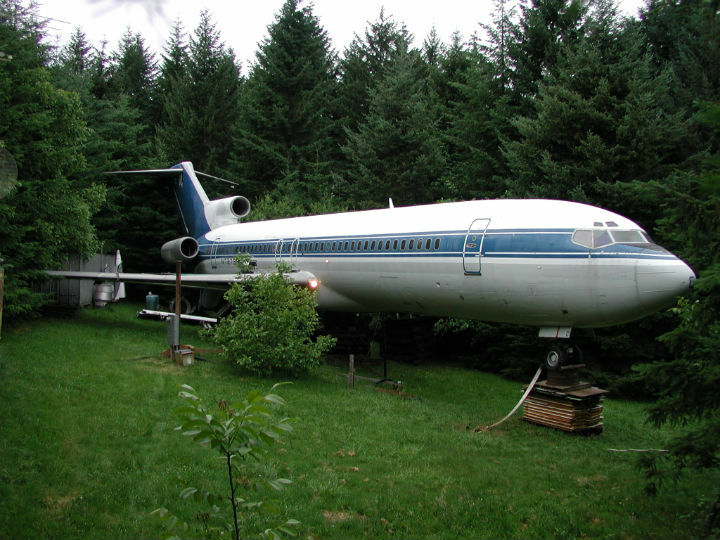 Prior to Campbell purchasing the Boeing 727 and transforming it into the masterpiece airplane home he now owns, the aircraft was, of course, used to transport different people to many destinations. Well, turns out it also transported somebody very famous and a dead body! Yep! 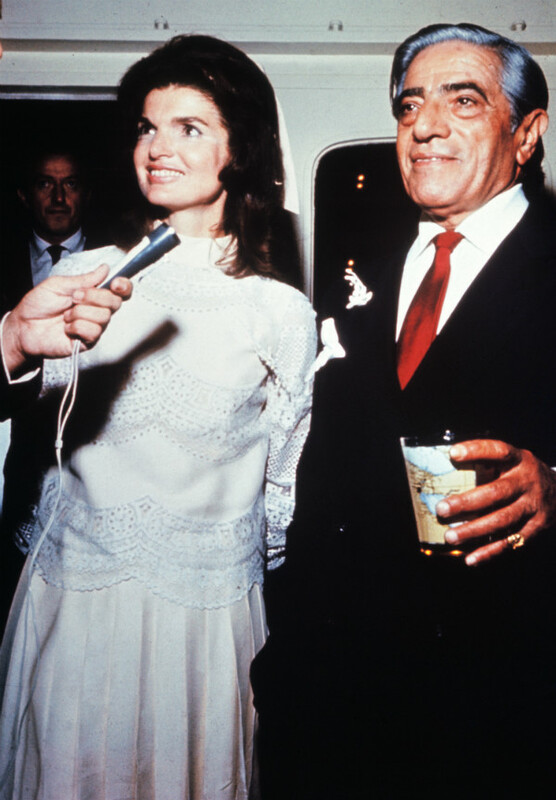 Campbell’s home now was actually the steel bird that once transported body of Aristotle Onassis, the Greek tycoon, to Greece after his death due to respiratory failure on March 15, 1975 in France. Aristotle’s long-time friend as well as wife during that time, Jackie Kennedy Onassis, who also happens to be a former United States of America First Lady, accompanied her husband’s body on the airplane.